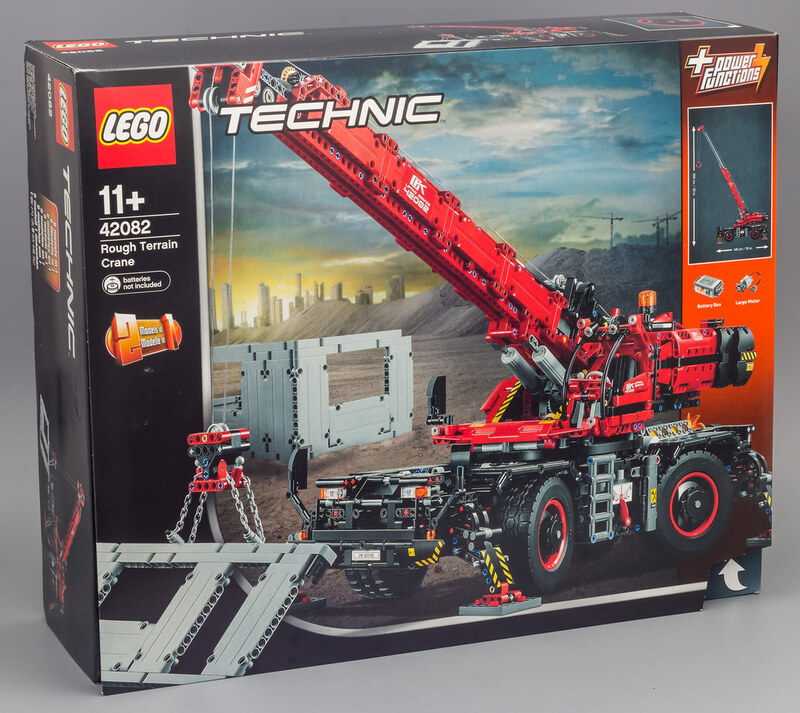 The biggest set of the second wave of 2018 sets is the Rough Terrain Crane. 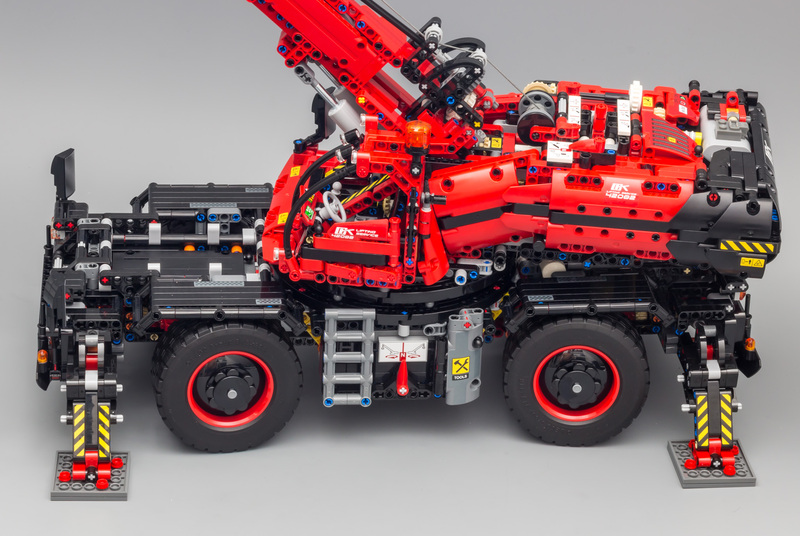 Actually, it is THE biggest Technic set ever, with 4057 parts, surpassing the 42055 - Bucket Wheel Excavator, which has 3929 parts. 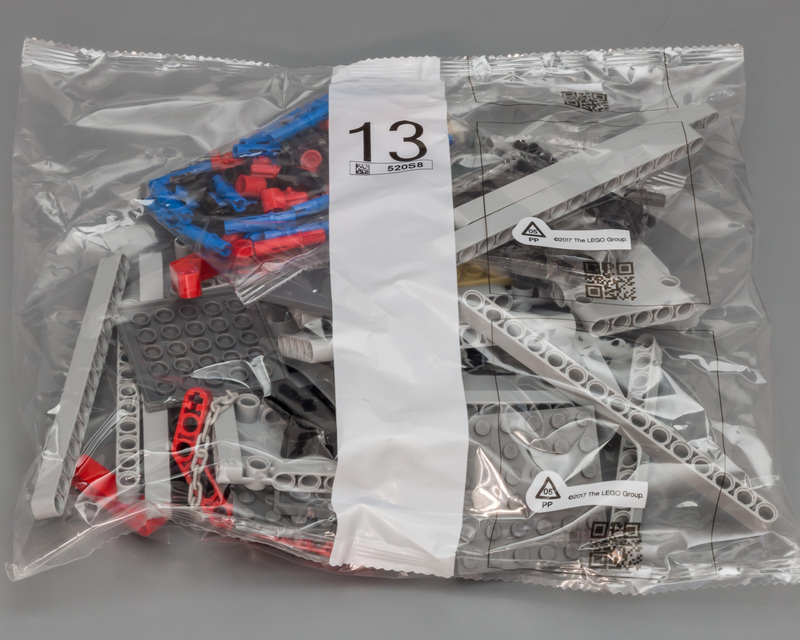 This set contains 128 parts more than the BWE. Which immediately raises the question; has TLG purposely made this set bigger, so it has the highest part count ever? The reason I am asking out loud, is that there has been some debate in the Technic Forum about the growing size of the sets, related to the functions. Some say that the part count is intentionally high, without adding significantly more (or better) functionality. While I do see a trend in sets getting bigger (i.e. 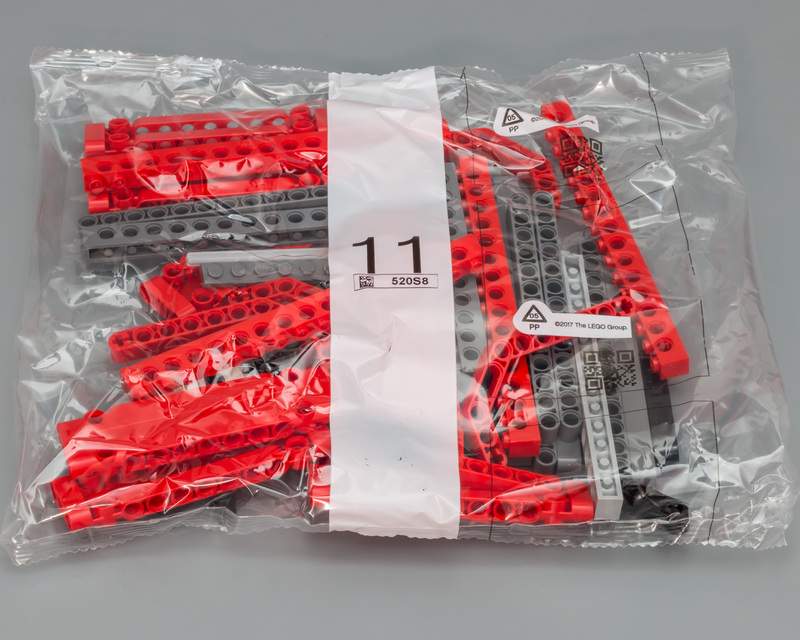 higher part count, thus higher price), I don't think that TLG designers are filling their workday finding out ways to add lots of unnecessary parts. I do like to think that the style of building is adapting/evolving to the contemporary standards/requirements. Of course, I don't want to sound too naive, because at the end of the day, it's all 'bout the money. It's all 'bout the dun dun do do do dumb. I don't think it's funny to..... Anyway, why not use this review to dive into this delicate matter. Before we start I like to point out that I do like big sets. 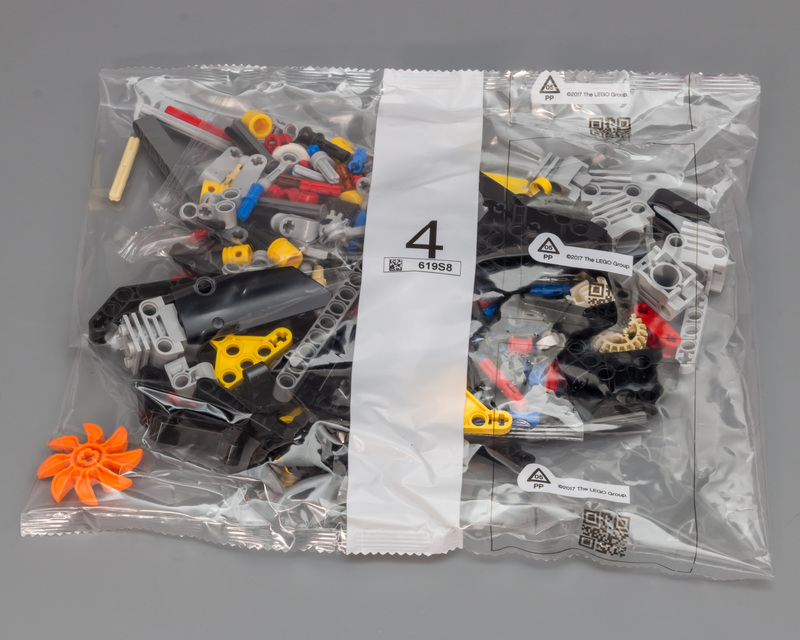 The experience of opening the box and seeing the plethora of parts is overwhelming. On the other hand, with Technic sets getting more and more expensive, I can understand that people stop buying the (bigger) sets. 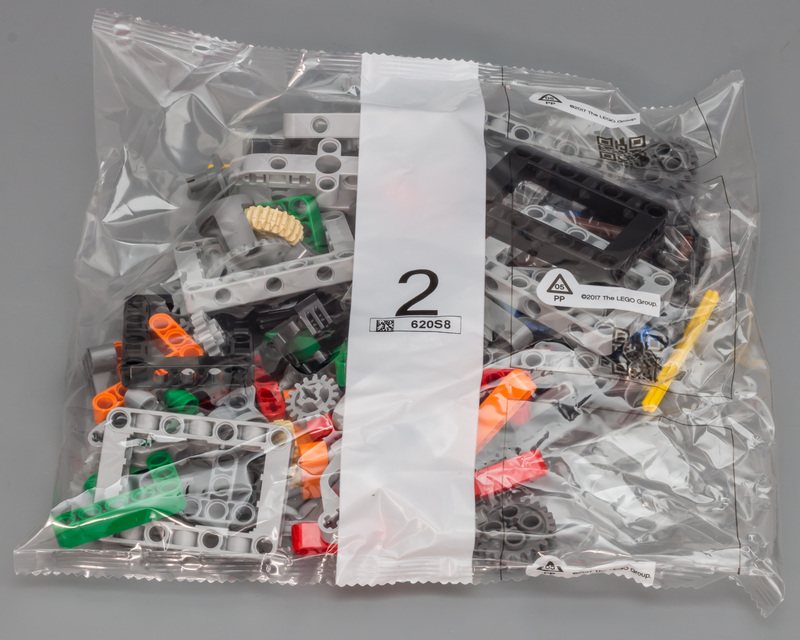 In this review, I simply want to find out if this set could have been made with, let's say, 3000-odd parts while maintaining the same functionality. Another thing I'd like to address in this review is the use of extra elements (playable items), like a chains, tools etc. 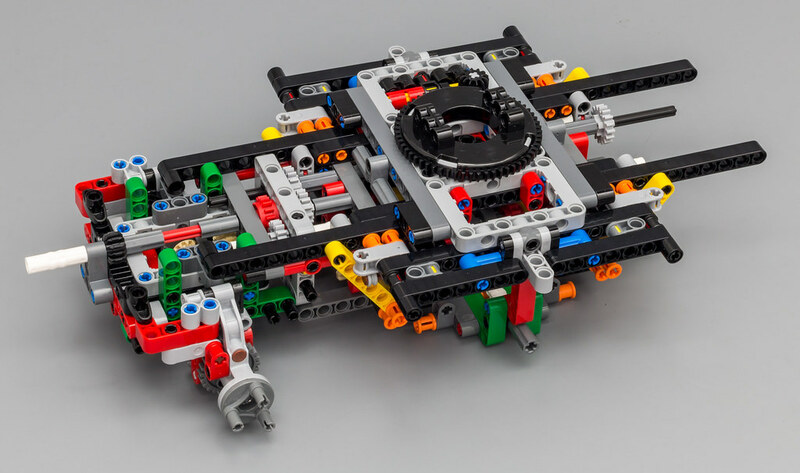 There has been some debate about this in the Technic forum, so I like to give you my opinion. 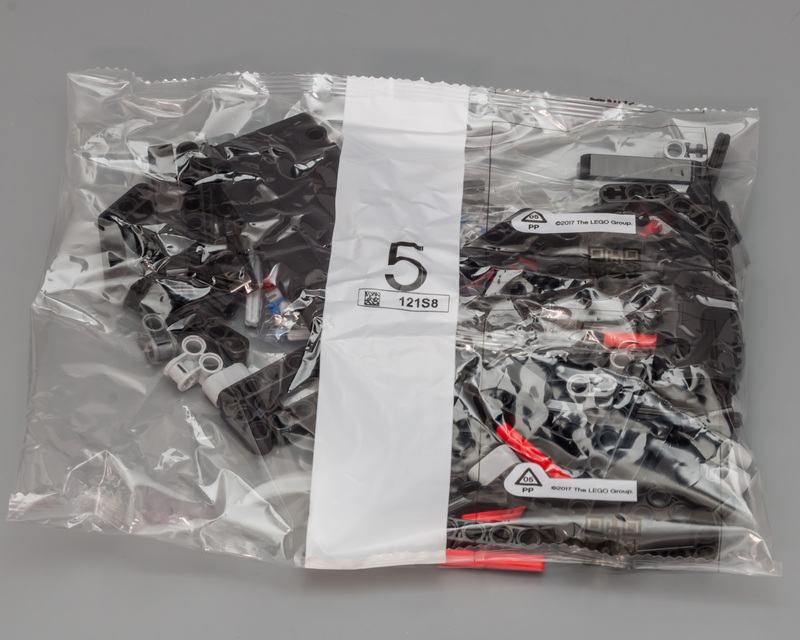 So, with an RRP of 229 euro, the price per part comes down to 5,6 cent per part, which is a steal. It's even slightly less than the BWE (5,9 cents per part). 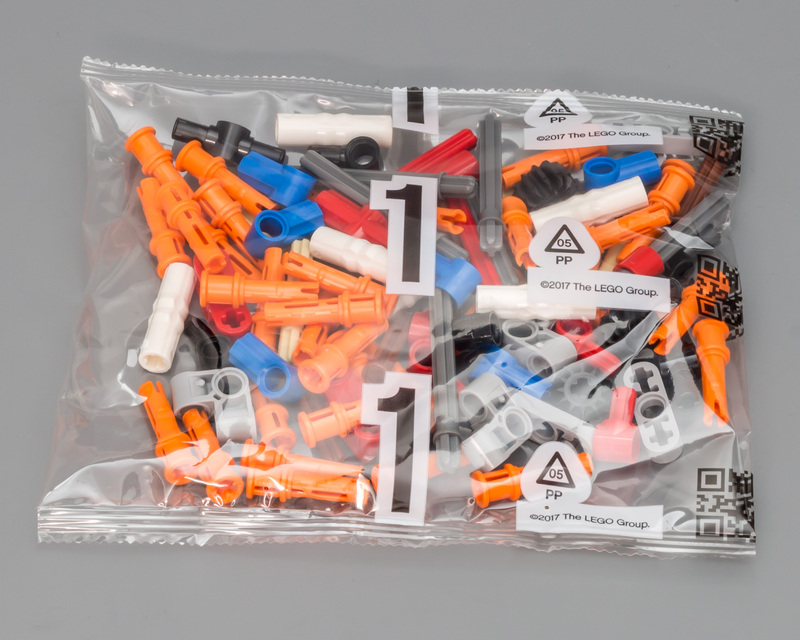 This makes it one of the cheapest Technic sets in terms of price per part. Let's compare some stats with previous flagships. 2011 - 8110 - Unimog - 189 euro, 2048 parts, 9,3 cent per part. 2012 - 9398 - 4x4 Crawler - 169 euro, 1327 parts, 12,8 cent per part. 2013 - 42009 - Mobile Crane Mk II - 199 euro, 2606 parts, 7,7 cent per part. 2014 - 42030 - Volvo L350F - 219 euro, 1636 parts, 13,4 cent per part. 2015 - 42043 - Arocs - 199 euro, 2793 parts, which is 7,2 cent per part. 2016 - 42055 - BWE - 229 euro, 3929 parts, 5,9 cents per part. 2017 - 42070 - All Terrain Truck - 249 euro, 1862 parts, 13,4 cent per part. 2018 - 42082 - Rough Terrain Crane - 229 euro, 4057 parts, 5,6 cent per part. All of these sets have Power Functions, some more than others. The Volvo is literally packed with Power Functions, which explains the high price and low part count. A potential candidate for a comparison with the 42082 - Rough Terrain Crane is the 42009 - Mobile Crane Mk II. 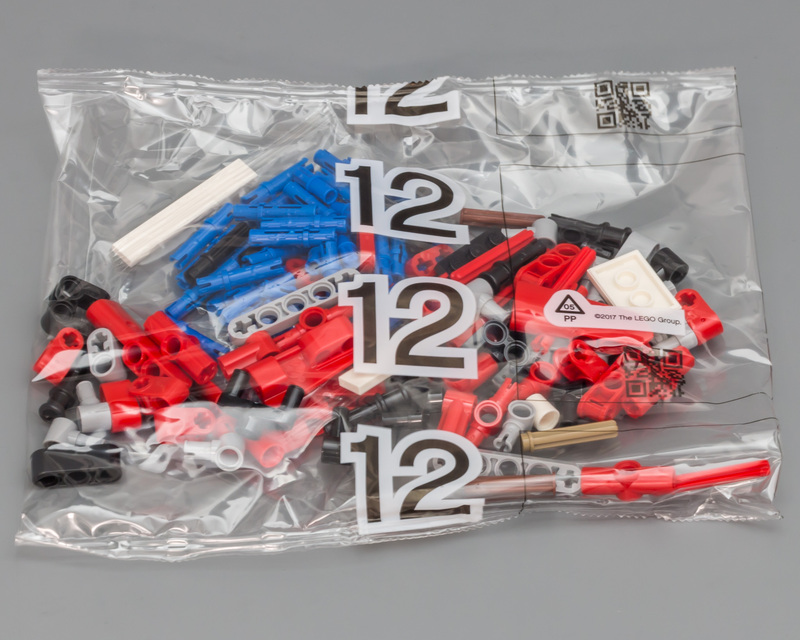 The 42009 packs 2606 parts for 7,7 cent per part, while the 42082 packs 4057 parts for 5,6 cent per part. So, the universally praised Mk II crane has a 37,5% increase in price per part. Or the 42082 has a 27,3% decrease in price per part, depending on how you want to look at it. That is 5 years ago, and I'm not taking inflation into account. In other words; for 30 euro extra you get 1451 extra parts. 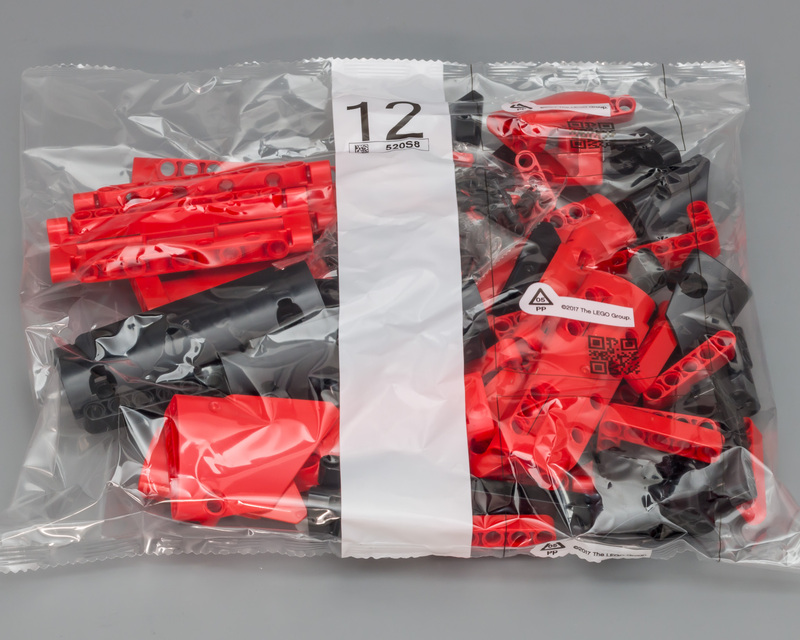 This comes down to 2,1 cent per parts, which isn't bad at all. Some of you might argue that this is not the way to compare two sets, but these numbers are based on RRP and part count, which are numbers we can work with. Since this set has four of the big Claas wheels, a gearbox, and not a lot of PF, I could also compare it to the 42070. But that set was way overpriced, so I don't think that would be fair. 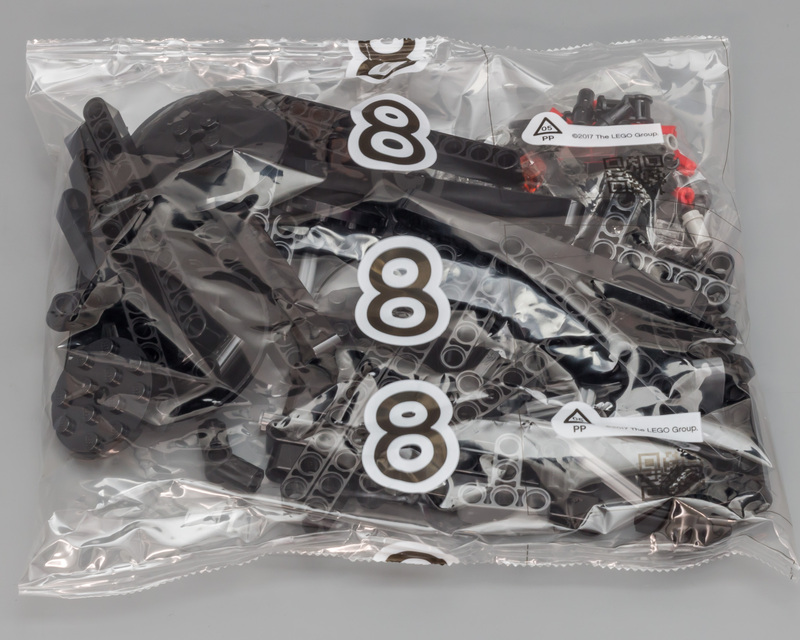 The average price of a part in a flagship, based on these 8 sets, is 9,4 cent. So for 229 euro you can expect 2155 parts. You get 1901 more than that. Thus drawing the preliminary conclusion that this set is big, but the price is more than reasonable. Of course, the original debate wasn't focused on the price per se, but whether the models are getting unnecessarily big. Let's carry on unboxing so we can find out. The front of the box shows the model and its Power Functions components, a Battery Box and a Large Motor. No sign of new Powered Up elements yet. It also shows a picture of the model with an extended boom, measuring 100 cm high till the end of the boom and a chassis size of 48 cm long. Going by the size this isn't some two-bit crane. But size doesn't always matter. The box has the same width and height as last year's flagship (42070 - 6x6 All Terrain Truck), but it's a couple of centimeters deeper. 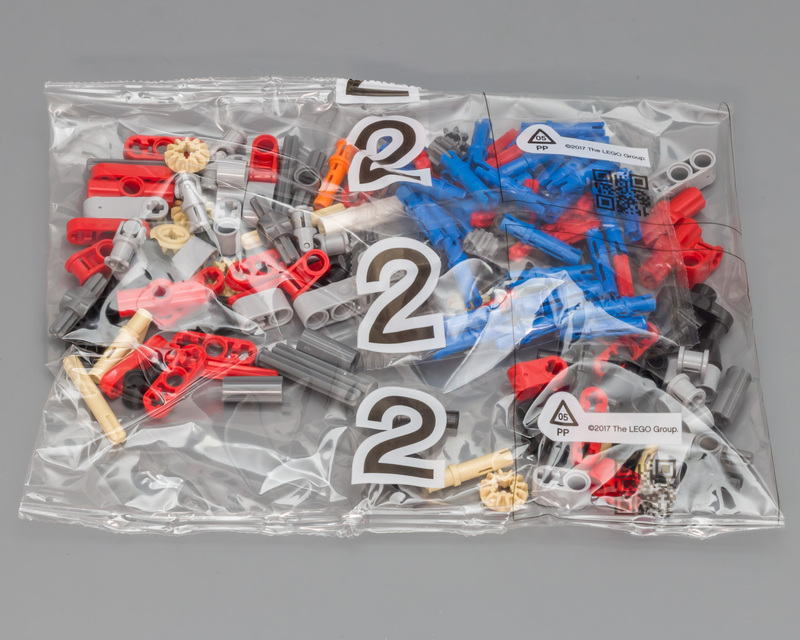 Like the 42070, this box also has the flap, common to flagship sets. 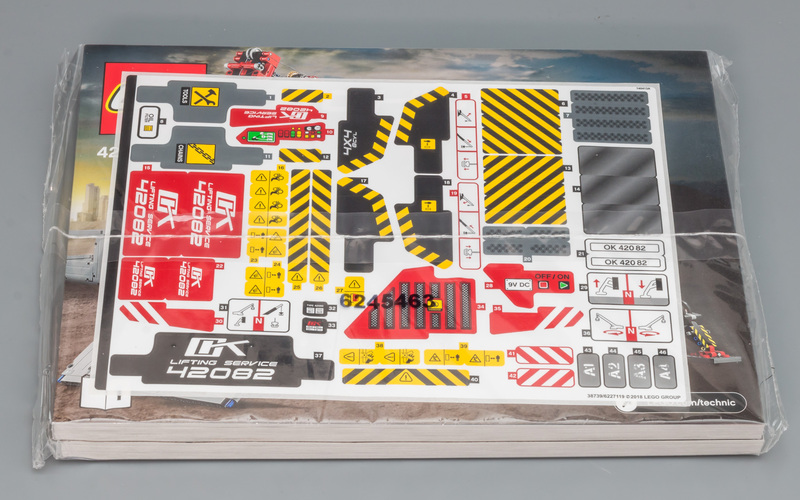 The inside shows a big picture of the model, which is most likely almost 1:1 scale. It's pretty impressive, that's for sure. You can also see that the upper body with the boom can rotate freely, thus 360 degree. 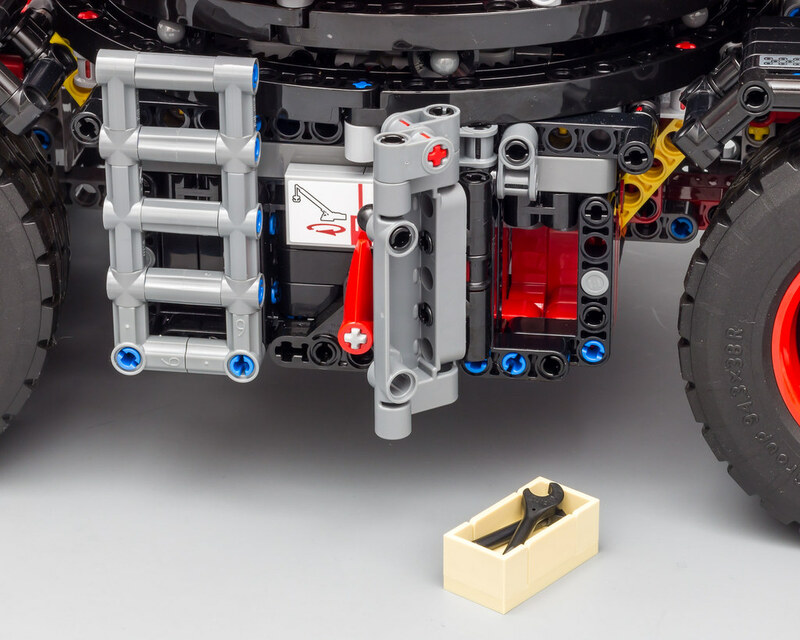 This means that most of the mechanics, and battery box, are probably placed in the upper body and not in the chassis. This makes sense, and we have seen it before. Another picture shows the boom can be raised up to 60 degrees. 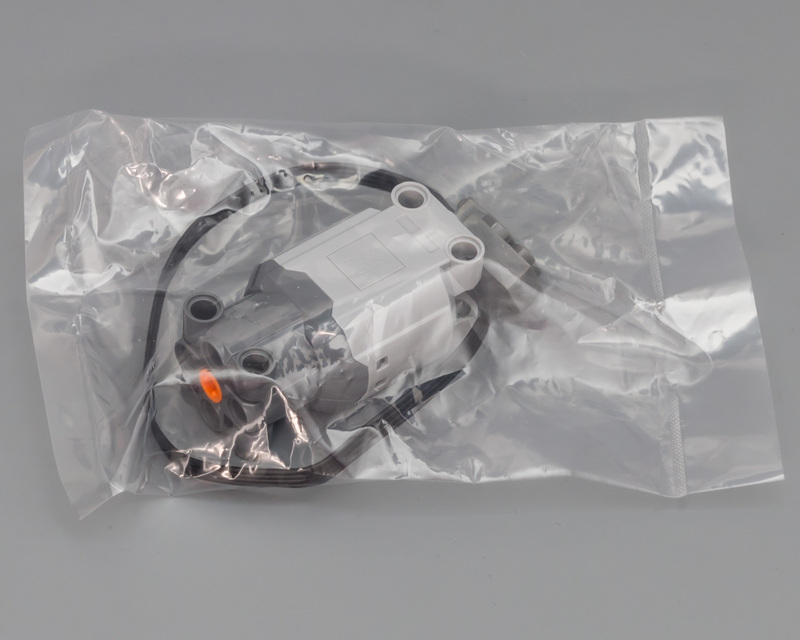 The inner box contains the sealed pack with instruction booklets and sticker sheet. And it contains the bags for steps 1 to 4. Two instruction booklets. One for the chassis and one for the crane. Makes you wonder if one person can start building the chassis, while the other starts working on the crane. Quite a few stickers to decorate this model. A construction vehicle just isn't the same without black and yellow stripes. 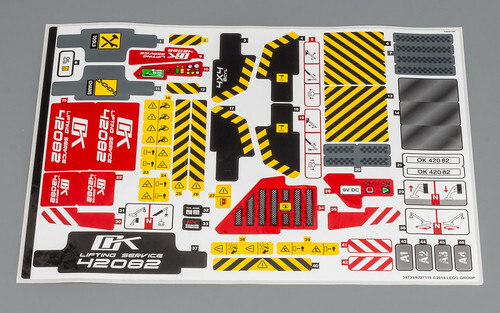 And of course, a bunch of stickers indicating how to operate the functions. A battery box and a large motor. 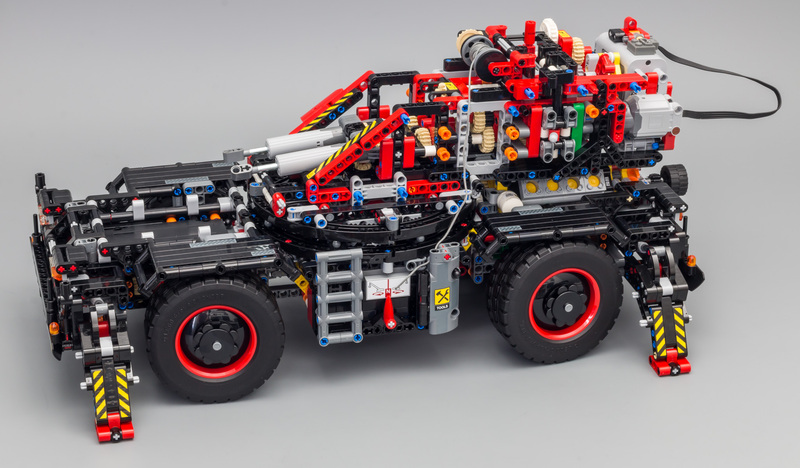 These, so called Unimog Tires, seems to be very common nowadays, but they have only been used in two Technic sets before. Four big red rims, also used in the 42054 - Claas Xerion and the 42077 - Rally Car. Here a picture with the tires fitted on the rims. 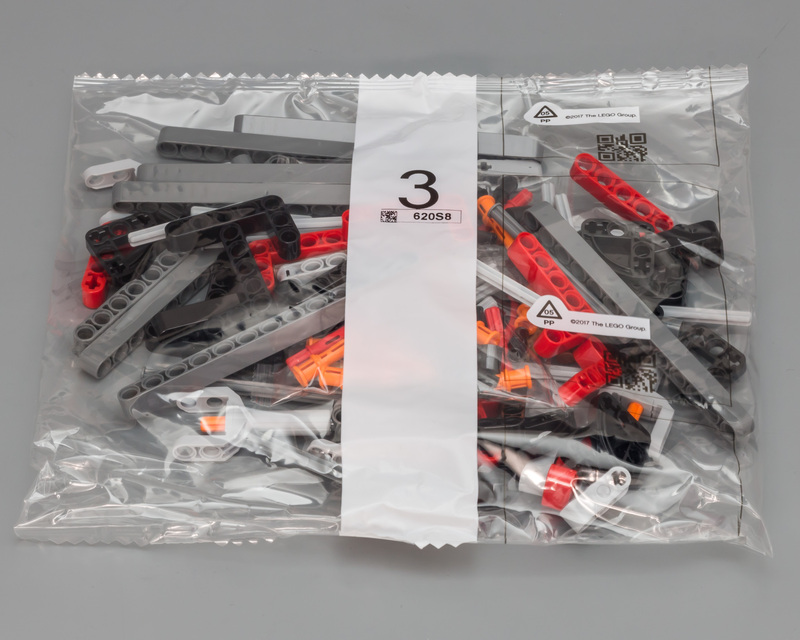 A total of 25 numbered bags. Not sure why I forgot to take a picture of the part itself, but here is a picture of the subassembly. This set contains a total of eight of these curved gear racks. 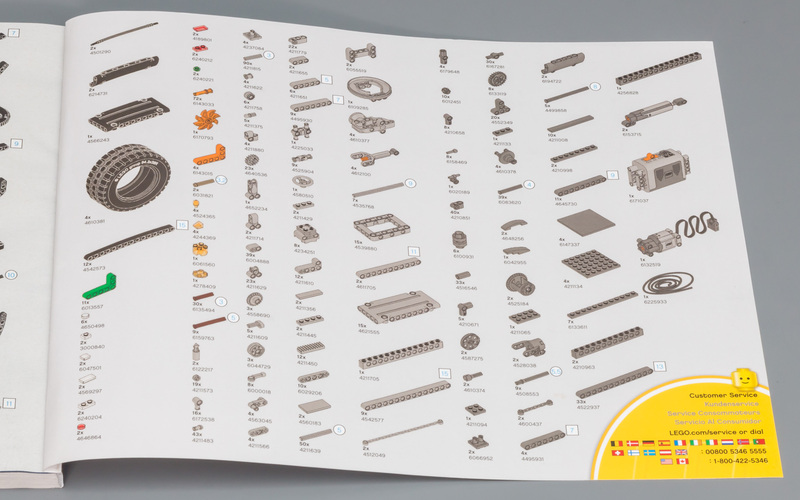 A whopping 4.057 parts, but still only two pages with parts. As expected we start with the chassis. And to be more precise; with the gearbox in the chassis. Really, orange pins?! Yes, really! Right off the bat, lots of gears are added to the chassis. 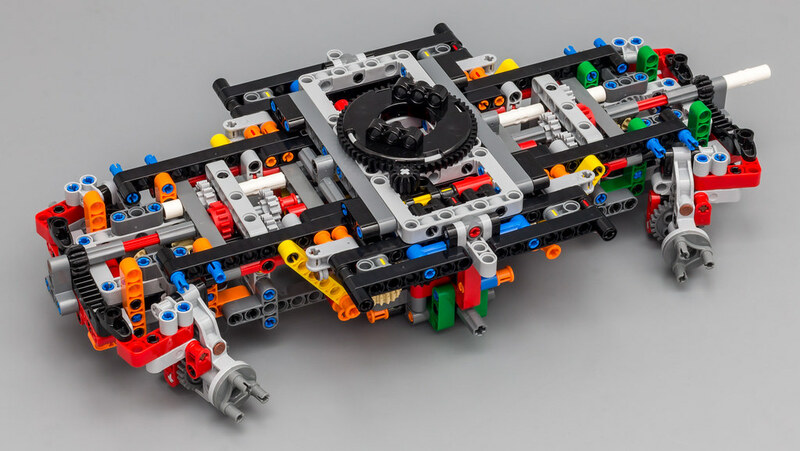 A white clutch gear is used in the bottom of the chassis. 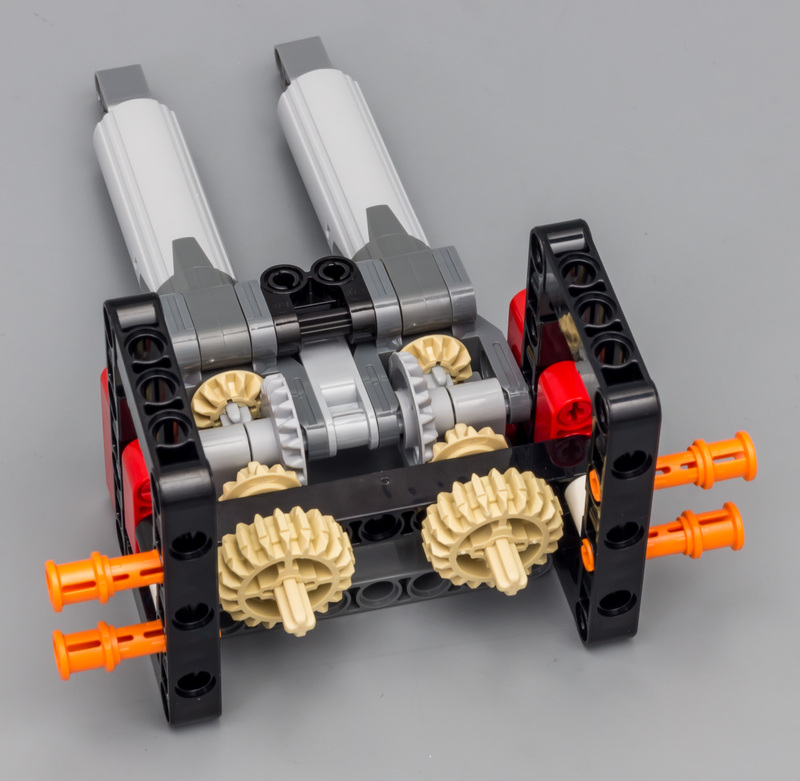 This indicates that these gears/axles will be connected to the Power Functions. At the end of the first step the center of the chassis has finished. 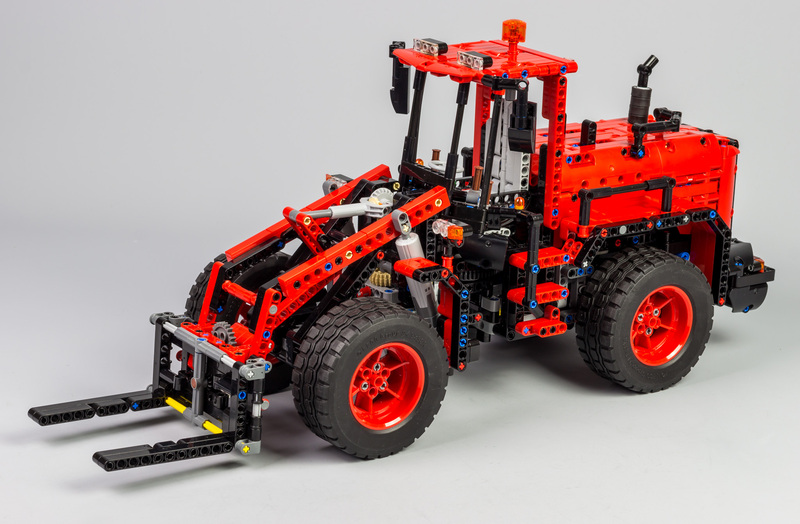 This chassis with center gearbox is kind of reminiscent of models like th 8110 - Unimog and the 8258 - Crane Truck. Lots of gears, densily packed in a small space. There's little room left. The bottom of the gearbox. Actually, I am being semi-serious here. The Forest Machine uses these liftarms in green, so it's probably cost-effective to use them in multiple sets. We are seeing this with other parts as well. 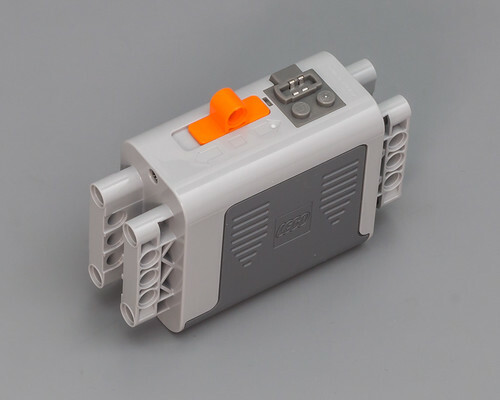 For example, the beforementioned orange 3L pins with bush and white 1L connector, etc. 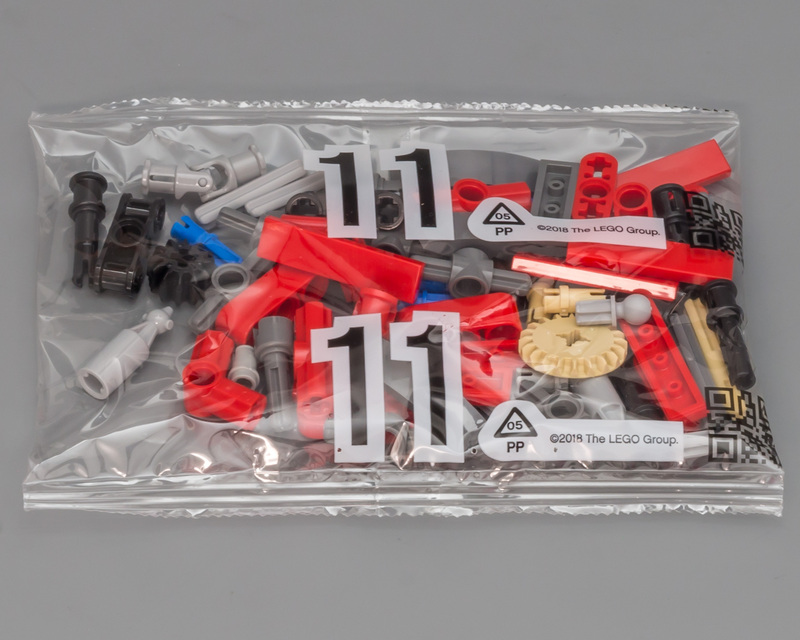 TLG tends to minimize the overall number of different parts used in (Technic) sets. I reckon this has something to do with optimizing their warehouse space. New parts are added every year and storage space is limited. Instead of using five different colors TLG uses one (maybe two) color. Doing this over the entire range of sets will save up a lot of space. 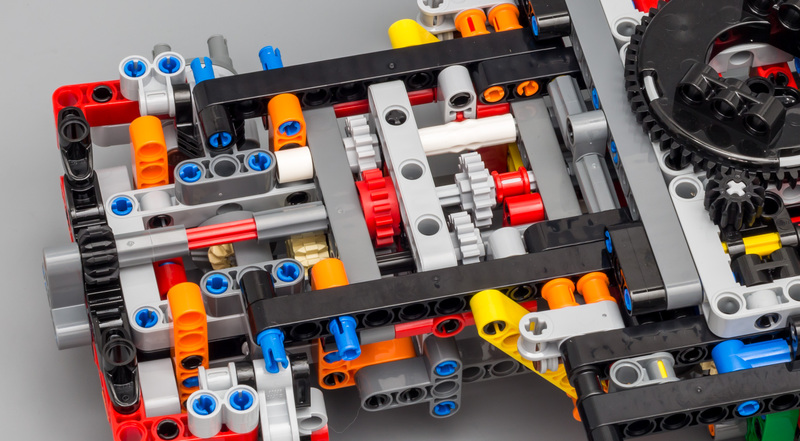 Technic seems to be the ideal theme to use these kind of strategies. 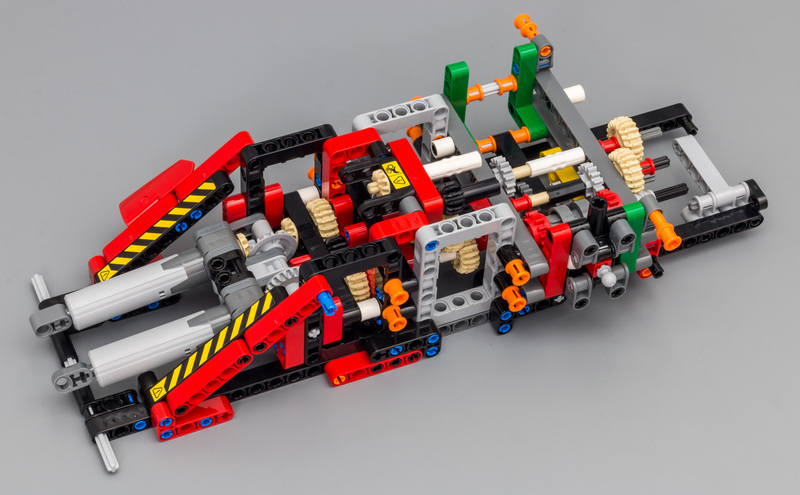 And it adheres to the "color vommit in the chassis" strategy. 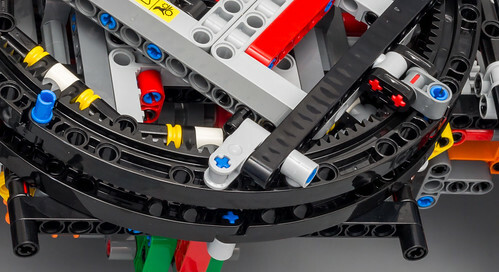 One of the wheel assemblies. As you can see there is no actual suspension. Not even pendular suspension. Which seems odd for an Rough Terrain Crane, but I am no expert. Here's the subassembly attached to the center of the chassis. An almost similar assembly attached to the other side. Instead of green liftarms, this one uses orange ones. This way you can more easily tell the sides apart. This is actually not a bad thing. I have mentioned it before, but I am actually a big fan of the color vommit approach. Altough I must admit that using these orange 3L pins with bush is definitely pusing it. Blue might have been a better choice, but that would have confliced with the Bugatti color scheme. Therefore, I think TLG made the decision to use orange in this as well. 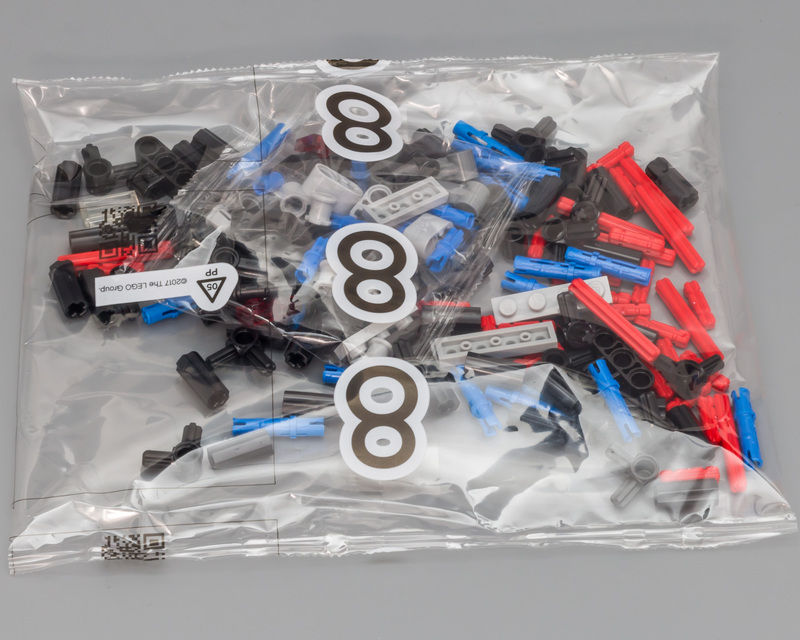 By the way; this set does also contain 40 of these 3L pins with bush in black. The picture below shows how you can align the wheels. After aligning them, you slide the 16T gear in position. 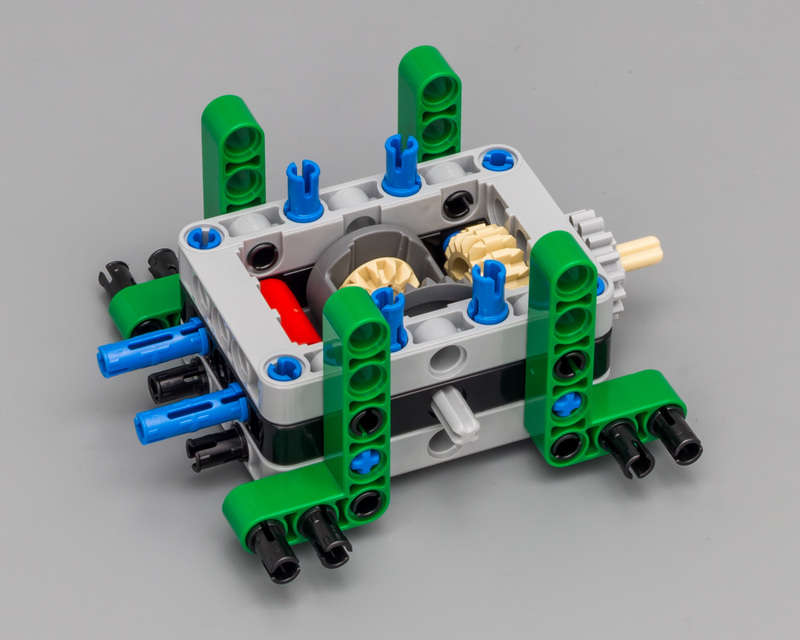 When I was building the set, I wondered why there was space between the gear and the liftarm, but it soon made sense. Just kidding of course. They do take a while, but since they are outriggers I find this acceptable. As long as the other functions aren't that slow. The chassis with front and rear wheel assemblies, and the front and rear outriggers. This is what you would expect from a crane this size. No unncessary use of extra parts so far. Next stop is the V8 engine with white oil filter and orange propellor/fan. I really like the oil filter. It's simple, but it adds detail to the model. The choice of orange as the color for the propellor seems odd, but it's likely a safety precaution. The emphasize that this is a part you need to watch, since it will be rotating when you move the crane. Not entirely sure, but it must be something along these lines. After the engine you will be building the connection between the chassis and the upper structure (crane body). This is done by using eight curved gear racks and an ingenious system in between. Click on the images to construct the ring. At that point you will attach the rims and the chassis is done. Worth noting is that the wheel caps in the rims use a lot of extra parts. Per cap approximately 12 parts are used, which boils down to 48 extra parts, just for the caps. This is an interesting part in the build. 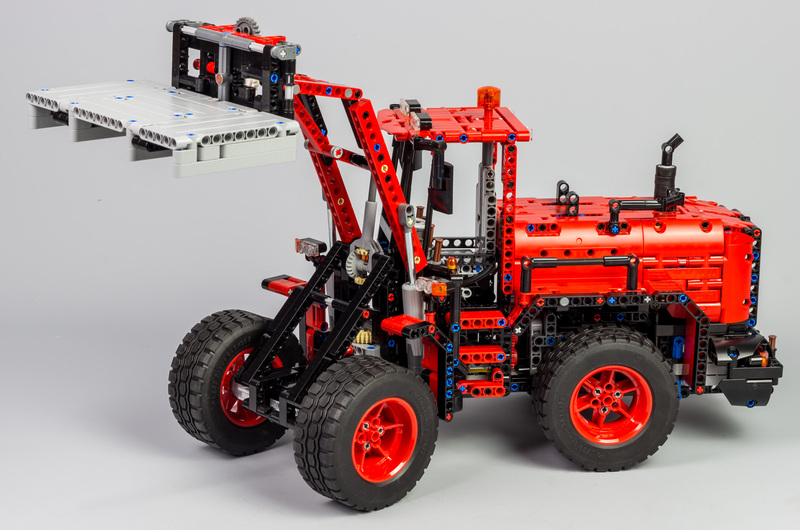 Reminds us of the 8043 - Motorized Excavator. Admittedly, I didn't think of this myself, but it has been addressed in the forum. Since the two 20T Bevel Gear with Pinhole have been placed on opposite sides of the actuators, this results in them turning in a different direction when the boom is raised (or lowered). Basically, this means that when the boom is raised, one of the LA's extends, while the other retracts. If one of the 20T gears was placed the other way around, this problem would not occur. Of course, the turning direction of one of the axles feeding the LA should be reversed for this to work. Since the gears attached to the LA's only rotate a tiny fraction when raising the boom, it leads me to believe that this is a calculated flaw. In this video I try to demonstrate the issue at hand. You continue to work your way back to the rear of the superstructure. Again, lots of gears and space which will be filled with gearboxes. This is the point in the second booklet where you can't build any further, untill you finish the first booklet. At this stage you will attach the upper section to the chassis. The boom is really massive. Feels solid like a rock. I am impressed with the sturdyness of this boom. It does a lot of panels and H-frames, so it's only logical, but I was still impressed. No wormgear to extend the boom this time. The other side of the boom with a white clutch gear for safety. The boom attached to the crane. Needless to say I am having a hard time getting the entire boom in the picture. The back of the upper section is closed with panels. The black ones can be removed for easy access to the battery. There are two gearboxes on the top of the crane. The left (bottom) one is to switch between crane and chassis functions. The right (upper) one is to switch between raising/lowering the boom, extracting/retracting the boom and lowering/raising the hook. The chassis functions are rotating the super structure and raising/lowering the outriggers. It is rather difficult to shoot decent pictures in the photo studio. I sure hope sets won't get much bigger than this. 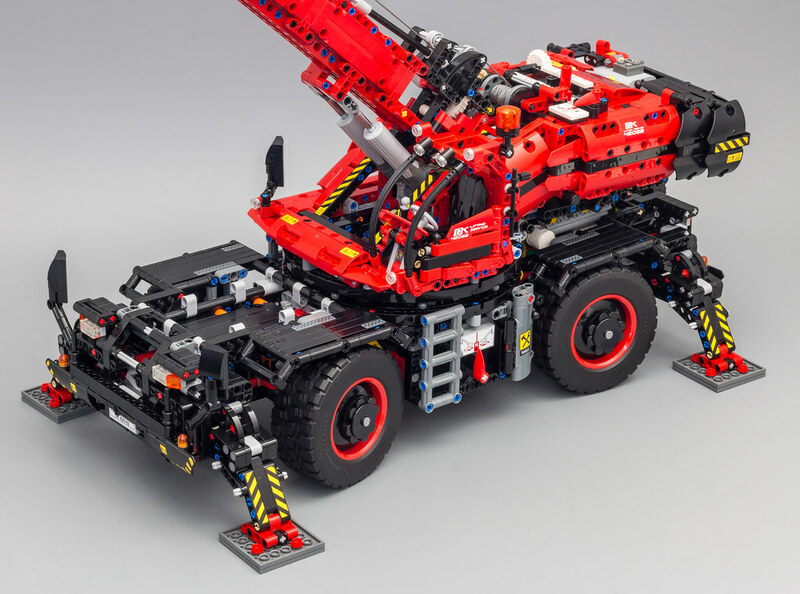 Looking at this model, I think TLG has done a remarkable job with this Rough Terrain Crane. 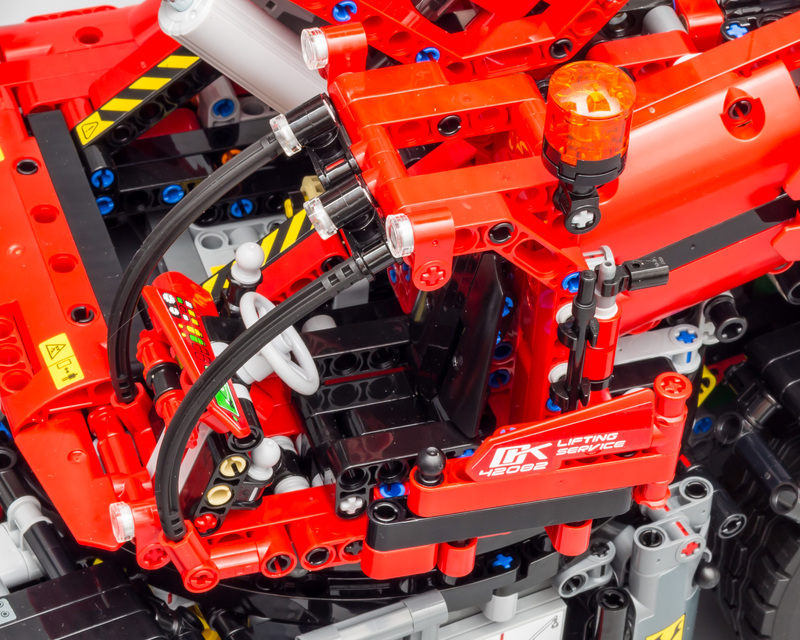 The black chassis, with red elements, combined with the red super structure looks spot on. 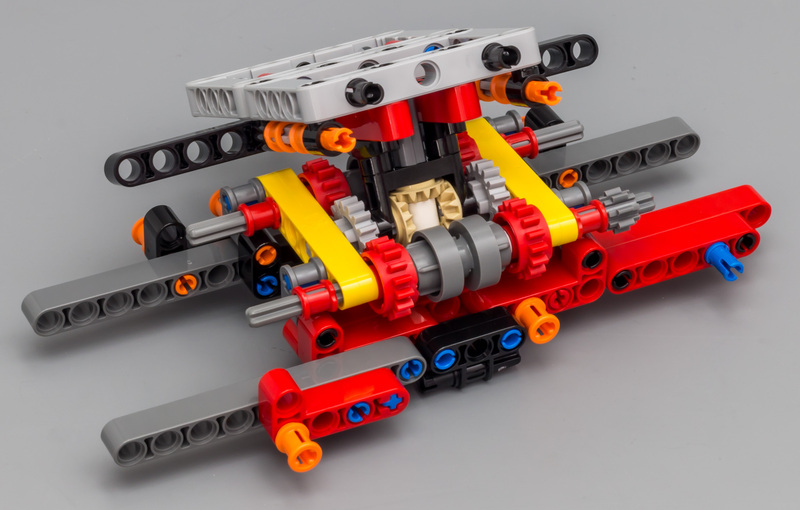 Lots of technic gears and elements provide an interesting build. I love how the two (or three) gearboxes work together. Here you can clearly see the gearbox on this side of the chassis is used to rotate the crane. 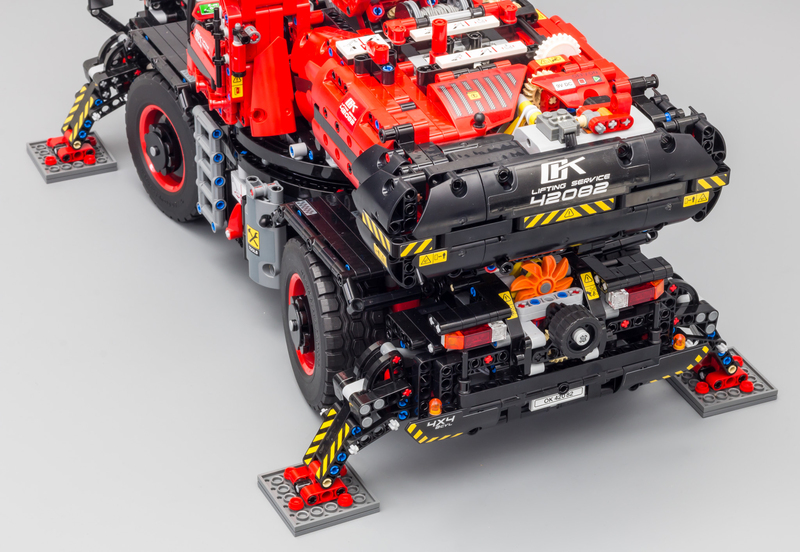 Because of the weight, the chassis tends to bend a little, but nothing to worry about. The boom of the crane can exend way more than this, but that makes is impossible for me to take pictures. A close up from the front of the vehicle. The cabin door swings open to reveal the interior of the cabin. And one from the reaar. 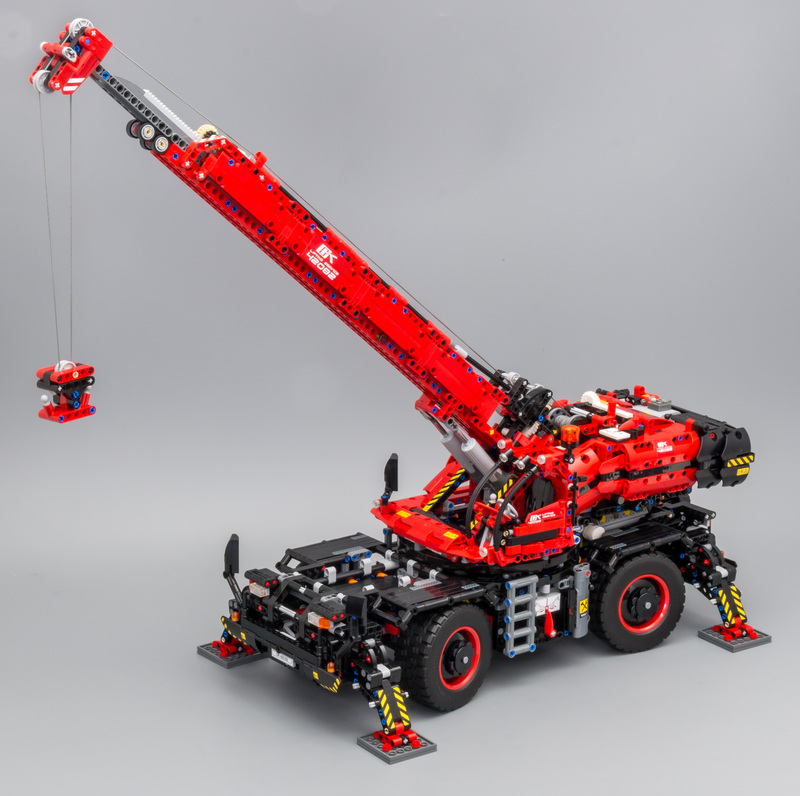 This model packs features you would expect from a mobile crane. Other than that there are some details like two cabinets which can be opened to store some gear. TLG has even added some walls which can be turned into part of a house or cabin. Okay, let's get this out of the way. The outriggers are slow, really slow. I turned them on this morning and when I came home from work, they were halfway. Obviously, I am joking...I didn't go to work today. It's not that bad, but it would be nice if they operated a wee bit faster. You do need to use the four plates for them to properly reach the ground. For a set this size steering and driving work properly. Even better than I expected. The thing I am most impressed with are the crane functions. These work like a charm. And, unlike the 42043 - Mercedes Arocs, this gearbox (or rather gearboxes) is very easy to understand. One look at the stickers is all it takes to be able to operate this thing. It offers a ton of playability. Linking gearboxes, instead of direct connection to a motor, can cause some slack. This can be seen when turning the crane. But this is just a minor gripe, just like the outriggers. A nice detail is the sliding door. It's time to talk about the added playable items, like this toolbox. Some people don't feel this is necessary and some even seem to be a bit annoyed by it. 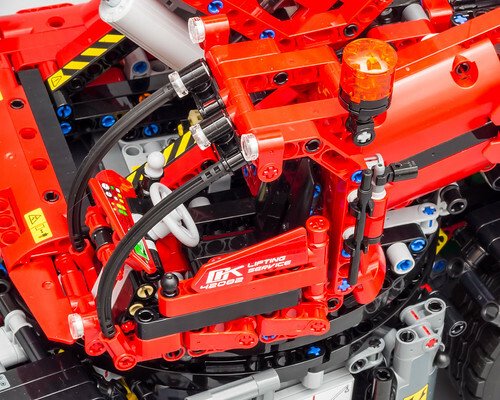 I have addressed this in my 42069 - Extreme Adventure review where I state that I like these added details. And I still do. The Forest Machine also packs some extra's like a chainsaw, some logs etc. 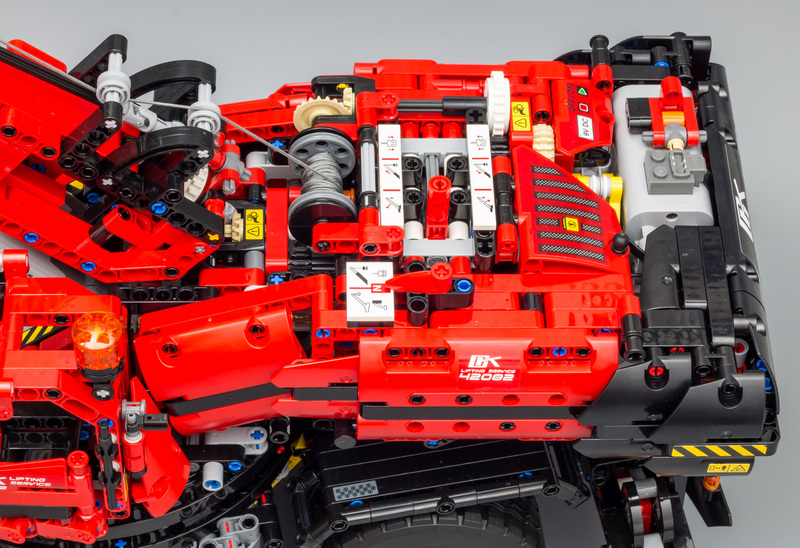 Actually, I see it in most of the Technic sets. 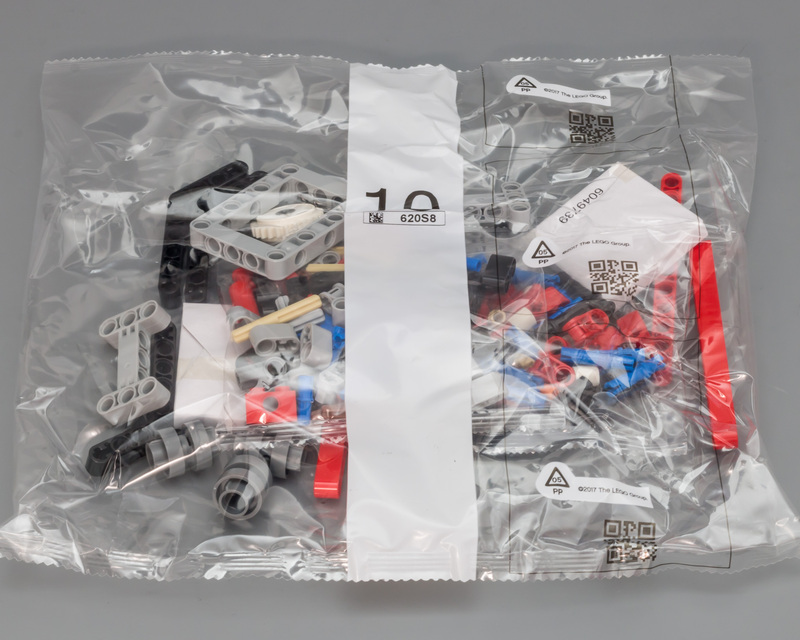 What I have seen is that this greatly enhances playability for younger LEGO fans. 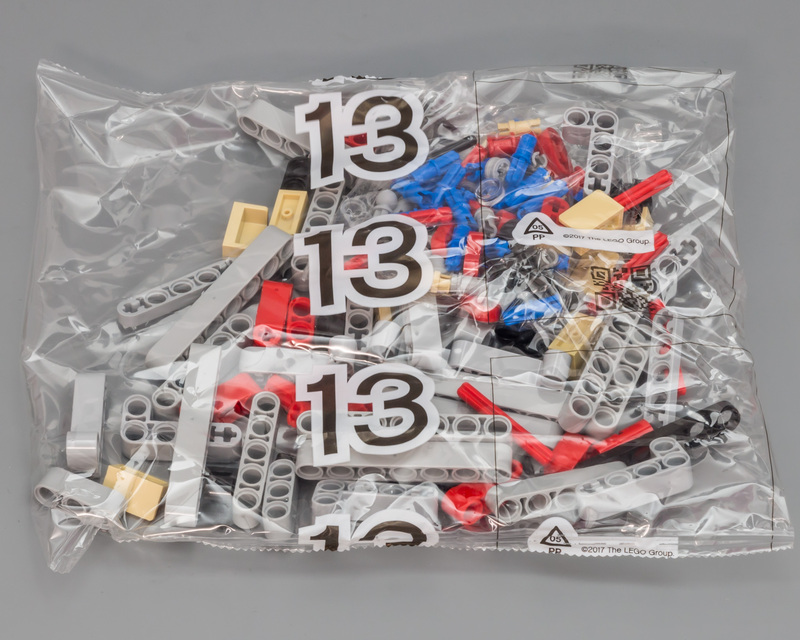 I am absolutely aware that this is a 11+ set, so it is not designed for a 5-year old. But seeing a 5-year old play with these Technic models and use all the extra items in the set for his "story" makes you realise that by adding playable items to a Technic set, it suddenly becomes a set for all ages. So, a handful of extra parts might be enough to prepare a 5-year old for Technic enthusiasm later down the line. After all, he (or she) is the future Technic target audience. Therefore, I am 100% in favor of adding these little details to Technic sets, even if these sets are 11+. And now for the part count discussion. No doubt this model could have been made using less parts. It you take away the playable items, wheel caps, grey construction panel and outrigger plates, you already save a couple of hundred parts. 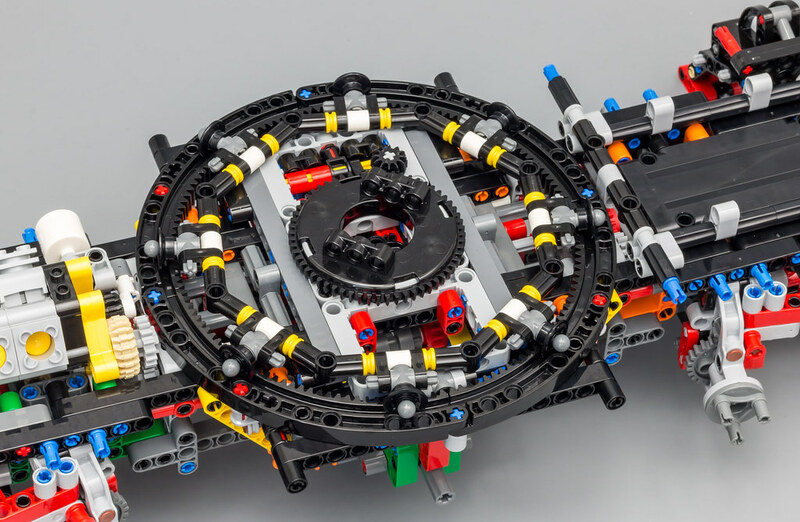 In the old days a Technic model used to be liftarms with gears inside. These days are over. Models are becoming more and more realistically looking, which means that less of the interior is visible. This also goes for the boom for example. In the old days we would have seen the interior of the boom and now it's covered with panels. 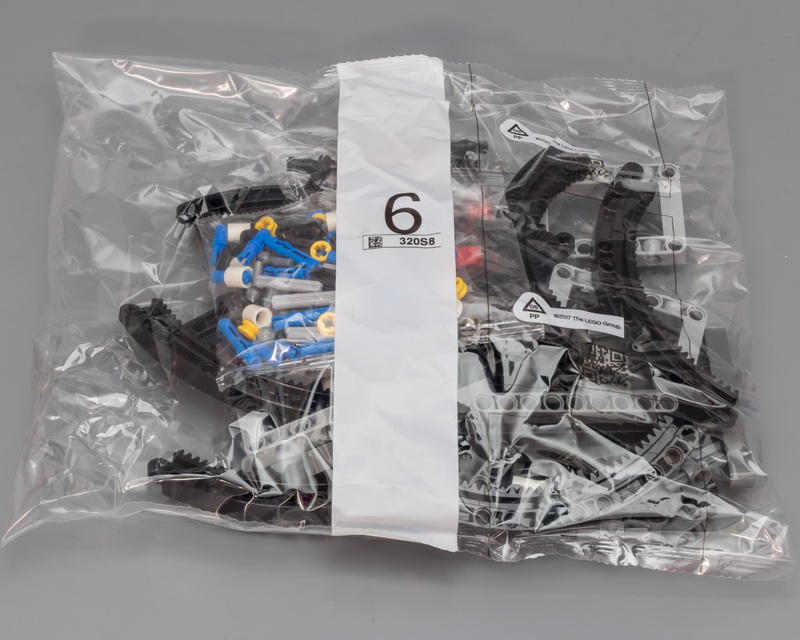 I am not convinced that TLG is deliberately adding parts to the boom just to have more parts. I think TLG is doing this because they need to compete with other toys in the stores and these toys look like the real thing. Therefore TLG wants its models to look more like the real thing to, resulting in adding panels and other embellishments. Granted, TLG's marketing department won't mind having the biggest Technic set every year, so they can use this in Ads. Like I said in the introduction; I am a fan of big sets. 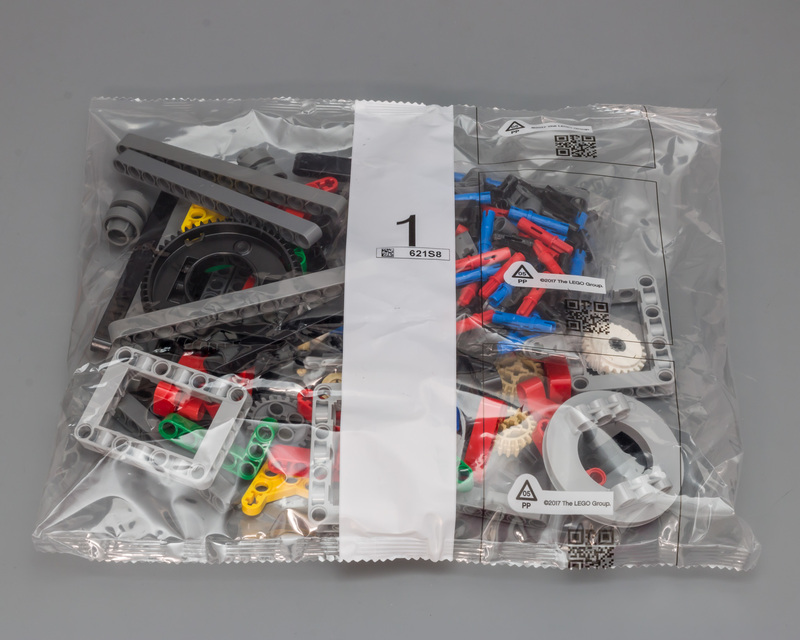 I love putting together a 4057 part set. 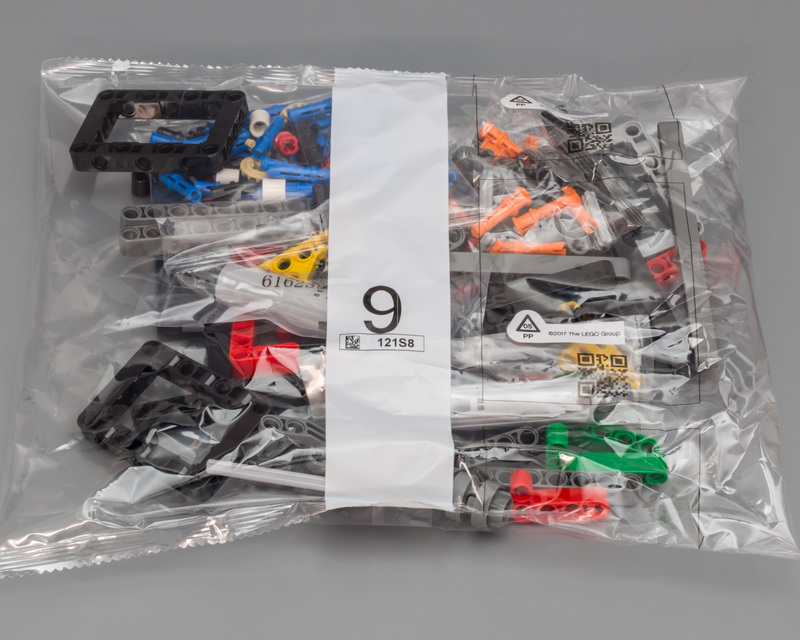 But I reckon people are more upset about the price of bigger sets than the part count. This can be a false assumption, because I know not all AFOLs think like this. But if TLG had used 3057 parts instead of 4057 they could have easily maintained the same RRP. 3000 parts at 229 euro is 7,6 cents a piece, which is still rather cheap. So my conclusion is that TLG might have upped the part count a bit, but still presented this set at a very affordable price. 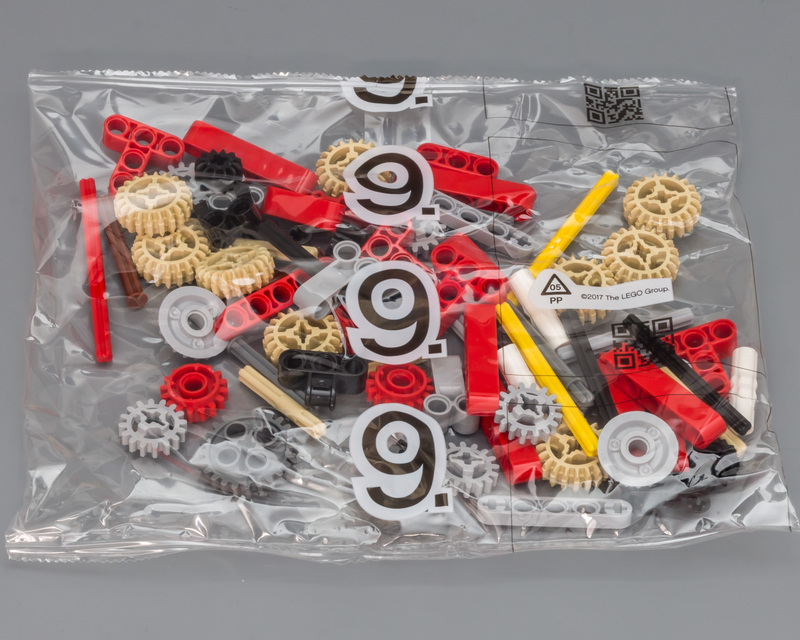 We already see this set popping up for around 179 euro, which boils down to 4,5 cent a piece, which is extremely affordabl for a Technic set. For me it would have been an issue if TLG priced this set at 349 euro RRP. Then I would have figured TLG was doing it on purpose. 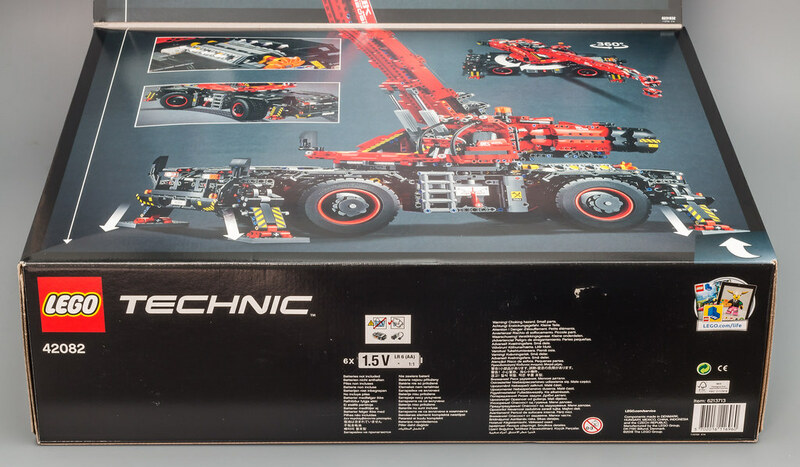 Basically, this is a UCS-like Technic set and you get it for 229 euro, or less if you do some online shopping. Personally, I think this is extremely good value for money. Of course your mileage may vary, but this is how I see things. The B-model, a Mobile Pile Driver, is a cop out, nothing more, nothing less. I mean, seriously?! 4000+ parts and we get a model that is 95% the same as the original model. And if that's not the worst part, it's ugly AF, as some people would like to phrase it. The Pile Driver extension looks like something I could have built....when I was four . 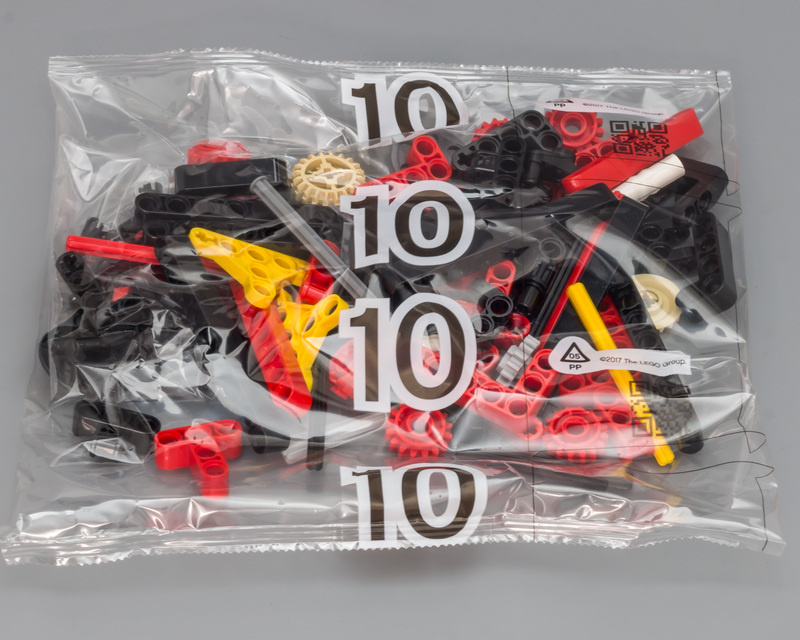 Maybe, well probably, I am insulting someone at The LEGO Group, but I can only hope that they were lacking time and/or resources, so they came up with this at the last moment. The argument of time is rendered invalid, because this is what you can in a couple of days. Well, maybe not everybody, but @nico71 was able to turn this set into a front loader. Nobody will probably argue that this would have been a better B-model. Not sure what TLG's policy is regarding alternate models but the 42030 isn't in production anymore, so I don't see any reason not go for something like this. The rear view of the model. And even the grey construction elements can be turned into something useful. I am a big fan of this set. It packs a lot of functionality and parts, for a decent price. The forum contains pages and pages with potential improvements, but that's out of scope for my review. Almost every set gets improved by AFOLs, so that's no surprise. Bottomline is that this is great set for existing AFOLs and new AFOLs alike. 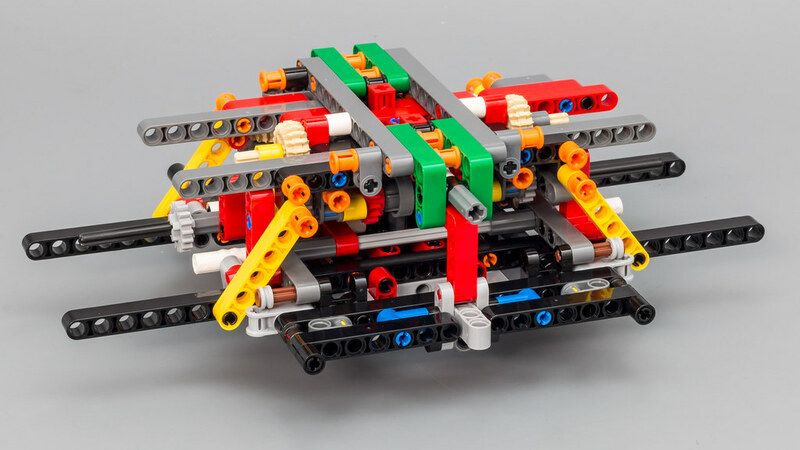 I can remember coming out of my dark ages in 2005, building the 8421 - Mobile Crane, which had a whopping 1885 parts. I remember the endless quantity of parts coming out of the box. Imagine a set with more than twice the part count. 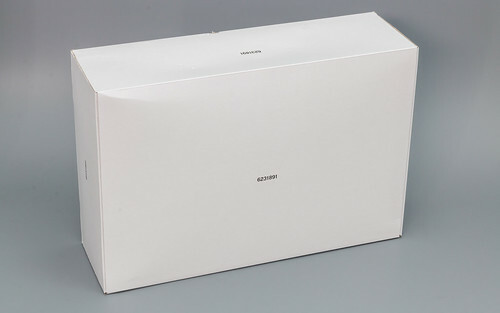 And again, this doesn't automatically mean a better set, but you will be impressed when you open this box. Much has been said about the color vommit in the chassis of this model. I have grown fond of color vommit, because I like the variety in the parts. I do enjoy seeing all the colored parts. However, using orange 3L Pins with Bush is pushing it to the limit, especially on a red model. I would have preferred blue instead of orange. My final conclusion is that for around 200 euro, you do get a LOT of value for money. I can see myself getting an extra copy, just because of that. 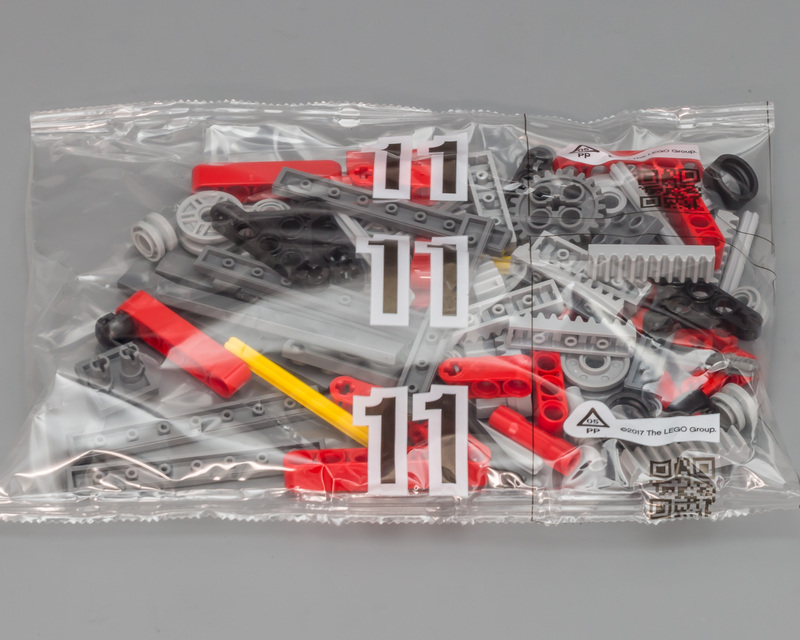 I would almost go as far a stating that this could be considered a UCS Technic set. I love the looks, color scheme, everything. 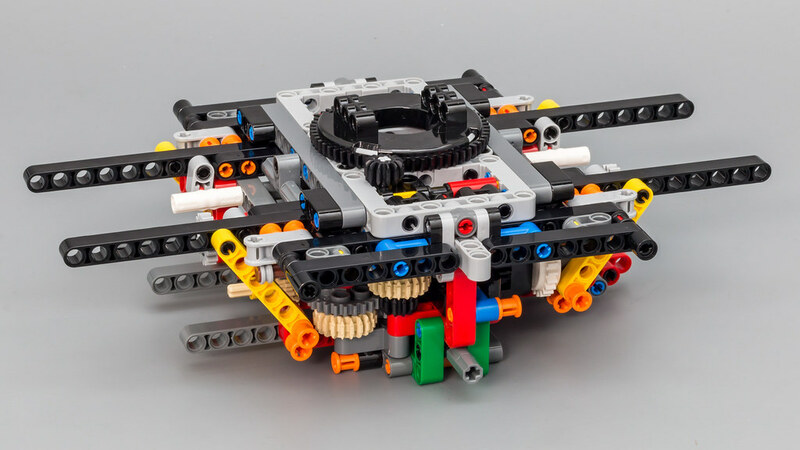 Very enjoyable build with several gearboxes and other functionality. Great features, with some room for improvement. No suspension though. Implemented features provide lots of playability. 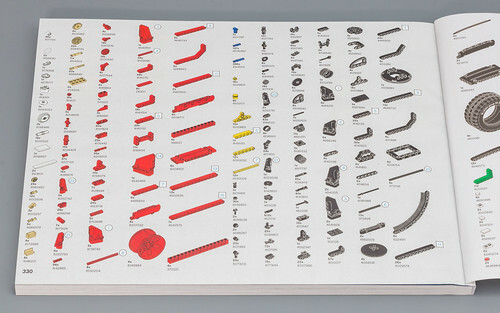 Mostly common parts, but you do get a lot of them. Price goes down to 4,8 cent per part if you shop around. It doesn't get any cheaper than this. 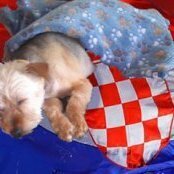 Woow, nice and helpful review @Jim. 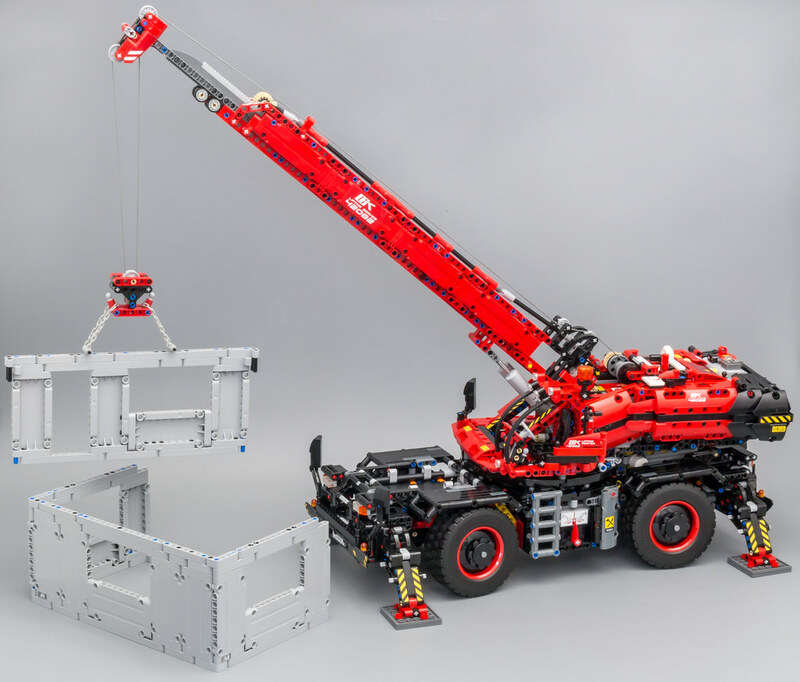 Too bad that there is no picture which is comparing the size of the crane with other big lego technic model like BWE or Porsche. Superb review. I really like this set. 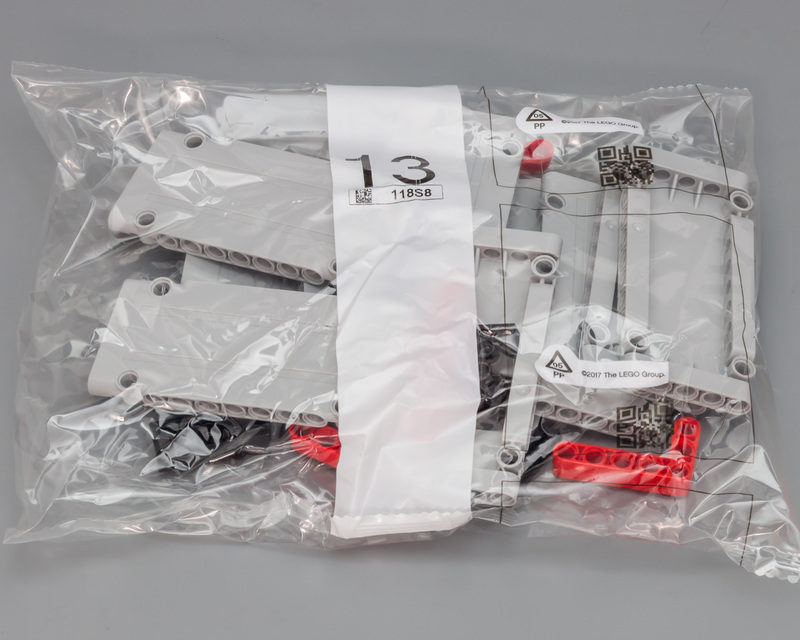 As you say, they could have made it with 1000 less pieces and still had the same functionality but also still have charged the same price and still appeared half reasonable in the process. When you compare it to the large Bugatti and Porsche sets it is laughable how much licensing appears to add to set prices. Mir also looks like a great parts pack. Great review! @Jim: did you create the alternative model B (or model C)? As to the set overall, it's definitely on the wishlist. PS: Great review @Jim, many thanks for all the hard work and dedication to the cause. Great review as ever @Jim I agree that its a good looking model and also agree with your feelings of the B-model. If it was a licensed model I'd understand the small changes for the B but in this case I want to build something else. 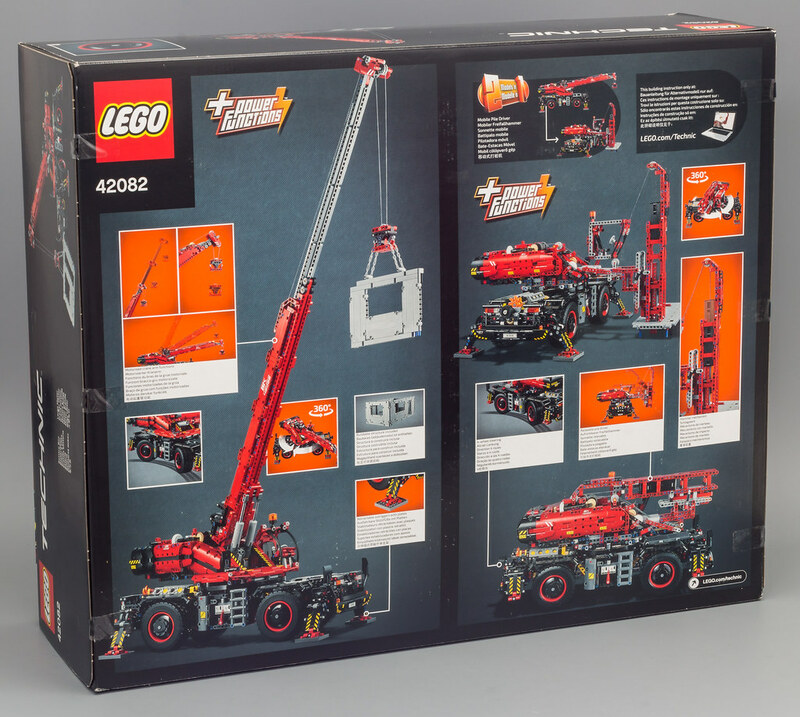 Im not entirely buying the price/partcount discussion myself, sure lego could have made this with 1000 parts less and sold for the same price, but clearly they felt that that would be a less succesful product, or they would have done so, same goes for charging more for this version of the crane. 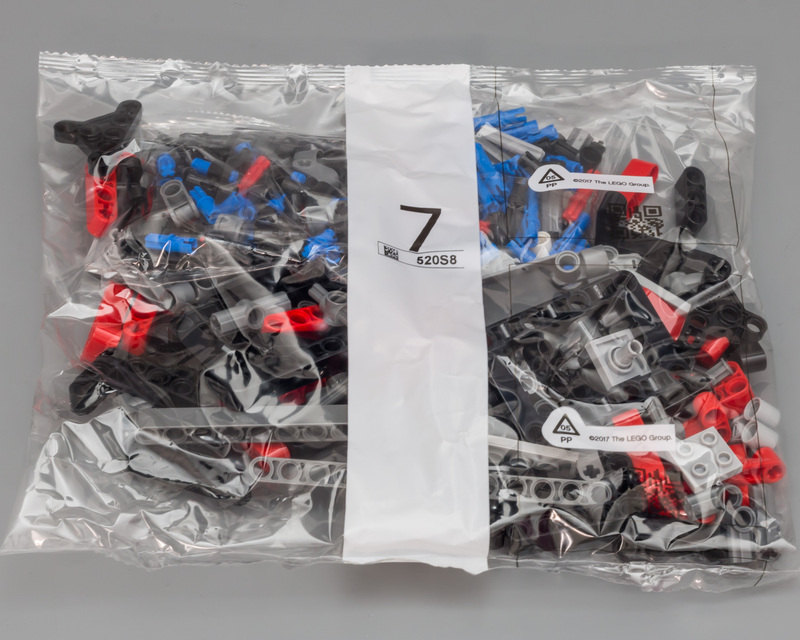 It still is a monstrous parts pack, so anyone looking to just get a bulk of parts to mess around with will be well-sorted with this set. 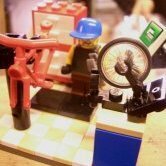 For someone just looking to have a cool crane to play with or display, there are i think better bang/buck options. As for the playable extras, i can respect Jim's point of view, and i dont see a problem with a toolbox and some chains in a 4000 part set, but the whole pre-fab building walls seem pointless to me. 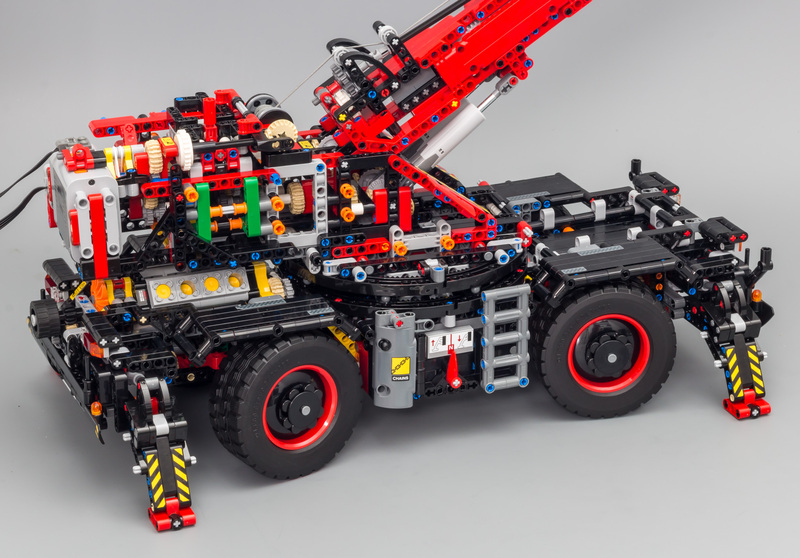 Most lego fans buying this crane will have plenty of stuff to lift, off-road vehciles, smaller cranes, or even the container from the mack truck. Sariel also made the point that the seperate walls need to be positioned so precisely, that manual intervention is needed and you cant just build the "house" by crane alone, which rather spoils the point. Great review. Excellent photos as always! The C model by @nico71 is awesome. It makes me want to get this set even more! @Jim, great review, as always, thanks a lot! Mine was delivered last Friday, luckily getting it for 188 €. At the moment I'm still building the chassis, almost throught the first book. 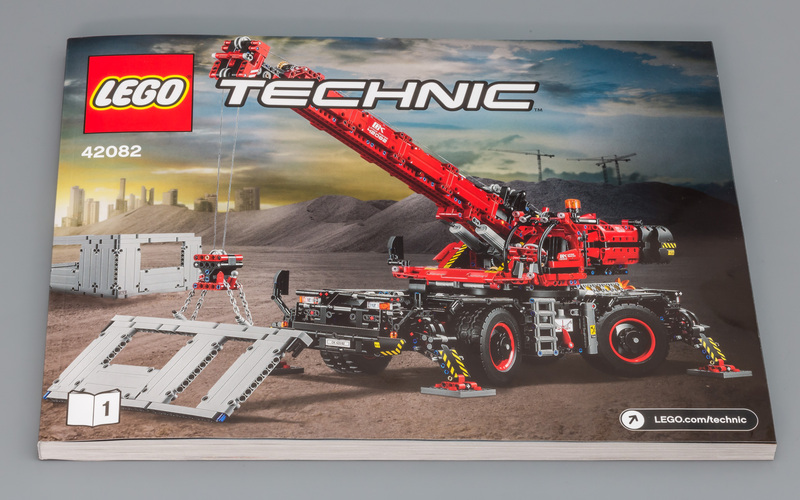 It sure is a fun build and I'm looking forward to another 430 pages of page turning excitement. Really, TLG, two books with 680 pages combined?!? The steps are at times so easy one could expect the set to be aimed at ages 6+. Different colors help to distinguish parts in a complex building process. But 680 pages plus this multitude of colors seems like an overkill to me. All complaints aside this is a large beast that's very rewarding to build. 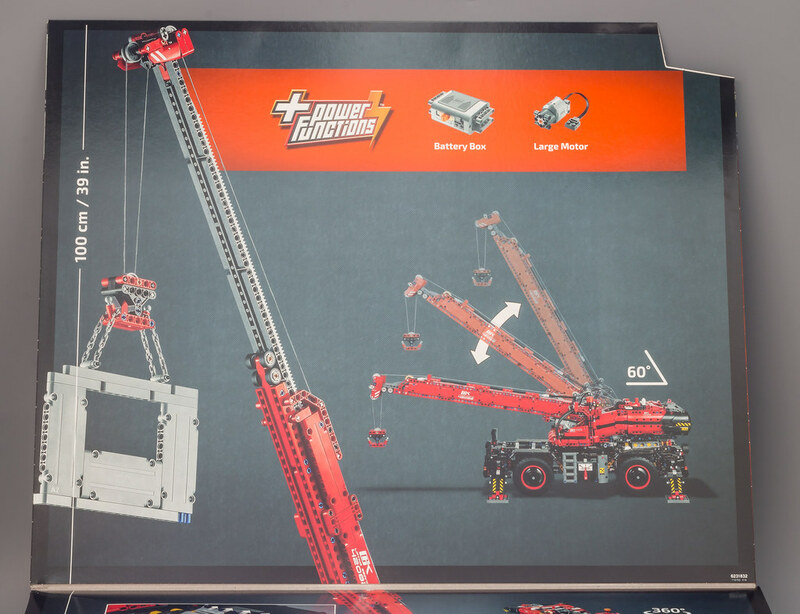 As a Lego technic model it comes close enough to real rough-terrain cranes like Liebherr LRT. thanks for this review...it has helped me to decide if I should buy this which is YES!! Great review as always, Jim - thank you! Thanks for this excellent review. I like the fact that you take on board feedback from the community. I am very much looking forward to building this. A true flagship set. I’m back on board after having skipped 42070. I though you were starting a new job today. Does your new boss knows you are a lego ambassador? Not﻿ sure what TLG's policy is regarding alternate models but the 42030 isn't in production anymore, so I don't see ﻿any reason not go for something like this. Well, AFOLs are fickle. We ask for different things all the time, so they do that, and now we complain. Simply that people ask then forget. Of note, I think the 3x7 red curved panels are new color, so this would be an interesting new part for me. Otherwise, thanks for your review, I find them helpful, and the written format is easy to digest in between work. 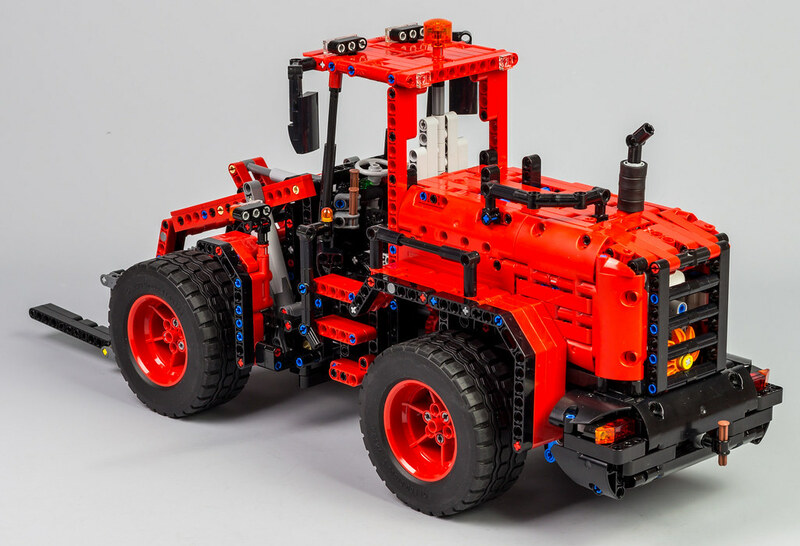 I think it's the best technic lego model of the second middle of 2018. Ahhh I have missed that. Didn't even think about it. Thanks. Well, except for the yellow thin liftarms. You can still those clearly. Black would have been better. This model isn't great. But your review certainly is and your picture make the thing look stunning. Good review, Jim. If I was looking to add to my collection I would buy this set and I love the alternative B model (great work). 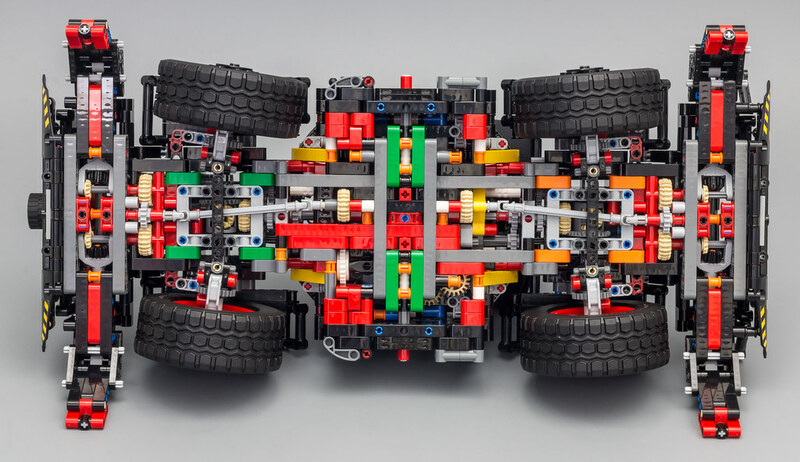 But I don't like the multi coloured chassis as shown from the underneath image. 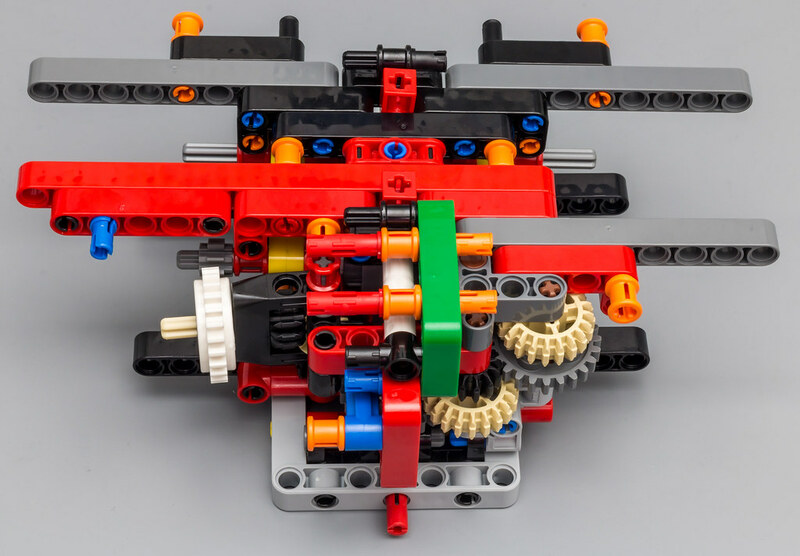 If they want to colour code they could have made the gear box in blue, the diffs could be housed in red and so on. The underneath image looks really bad and makes no sense to use so many different colours. Great review as always, but I am biased as i loved it the first time i saw it. 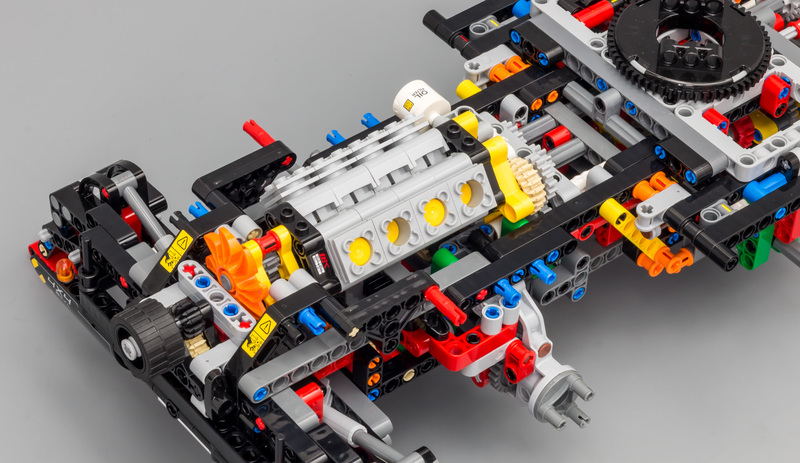 Interesting angle on the evolution of technic sets, not something i'd really considered. For me this is an excellent balance of proper technic (gearboxes, steering, ring gear bearing) and making it look more realistic. Sets like the Chiron are too looks orientated for me. 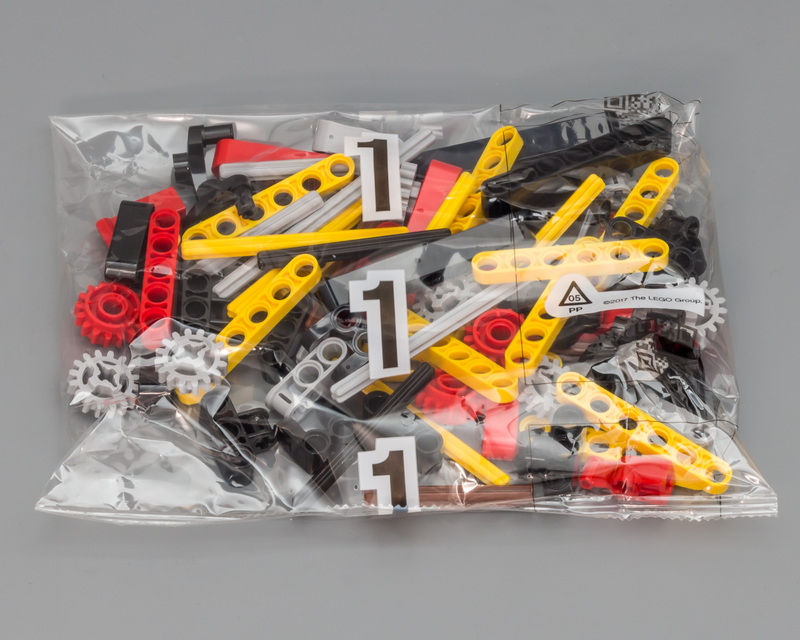 This is a hairy-chested technic set that brings out the 12 yr old giddiness in me. And that what opens my wallet... i'm basically a 12 yr old with a budget!! PS. Do you live near @nico71 or his he your alter-ego?! the pics of his excellent C model look to be taken in the same place...! What an awesome review Jim! I love hove you managed to keep it simple and easy to read despite the size and complexity of the set. And, of course, comparison with the other sets looks amazing. Thank you! However, could you please elaborate on this part? Since the two 20T Bevel Gear with Pinhole have been placed on opposite sides of the actuators, this results in them turning in a different direction when the boom is raised (or lowered). Basically, this means that when the boom is raised, one of the LA's extends, while the other retracts. If one of the 20T gears was placed the other way around, this problem would not occur. Of course, the turning direction of one of the axles feeding the LA should be reversed for this to work. Since the gears attached to the LA's only rotate a tiny fraction when raising the boom, it leads me to believe that this is a calculated flaw. What is wrong with the drive? Why should axles feeding the LA be reversed? Why is it a flaw at all? 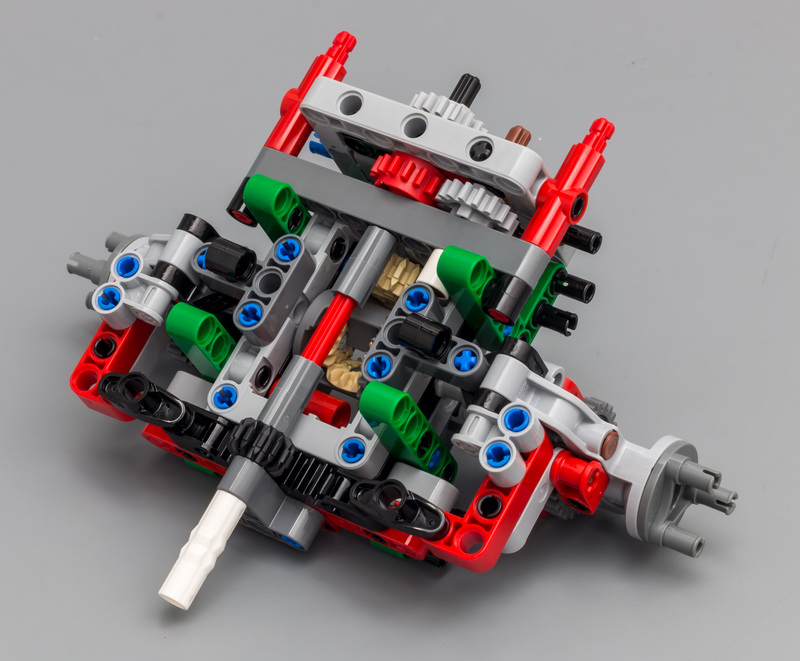 A 12-tooth double bevel gear takes its place right between 2 20-tooth double bevel gears and everything works just fine.